The biggest criticism levelled at those who argue for an expansionary investment programme to restore economic growth and repair public finances is that we have no money. Yes, it would be a good idea it is conceded but unfortunately we are broke. We have to stick with the current strategy of contraction and cutbacks even if it leads us into receivership and IMF sovereignty. Well, here’s the good news: we do have money. We have considerable resources. We can turn our fiscal frowns upside down. How much do we have? The IMF’s World Economic Outlook gives us some clue – though, in truth, the ESRI has presented this data in their quarterly commentaries. Let’s go to the IMF data first. They provide data on Government’s gross debt and net debt. Net debt is not a figure that is used much (which is why the IMF data is helpful). Take a household that has outstanding debt of €150,000 (house, car, credit card, etc.). That’s the ‘gross debt’. But the household also has cash and investments (shares, etc.) totalling €60,000. Their net debt is €90,000 (and that’s not counting house equity, pension fund, or that antique heirloom received as an inheritance but worth a decent bob). Similarly with Governments which hold cash and financial assets in various funds. The difference between gross and net debt can be considered as ‘cash and assets on hand’ – available to the Government in an emergency. What does the IMF data tell us? NTMA cash balances: this is the ‘cash-on-hand’ accumulated through pre-borrowing – borrowing over and above what is needed by the state for current funding purposes. This is kept as a buffer in the eventuality that there are temporary problems in accessing the international market. It can be referred to as ‘rainy-day account’. At the end of June 2010 cash balances made up €20 billion. This is not an argument for ‘raiding the piggy bank’. A progressive investment strategy must adhere to the fundamental principle: resources should be made available for those investments that we would have to make in any event, regardless of the recession, to boost future productivity. In many instances, therefore, we wouldn’t be diminishing our cash and assets at all, merely re-directing it. Take, for instance, rolling out next generation broadband to 90 percent of all households and businesses; no one doubts the potential to boost our productivity and enterprise performance. IBEC estimates it would cost €2.5 billion with a full return-on-capital within twelve years. If the Pension Fund got involved in this investment, it wouldn’t be a ‘raid’ – it would mean redirecting investment in foreign assets into this asset. The key point here is that it would not result in a diminution of its asset base. If we were to engage in a five-year investment programme of €15 billion (probably on the high side but hey, its an emergency and our infrastructural deficits are so profound) we would end up, at the very minimum, with cash/assets on hand of 26 percent of GDP (according to the IMF) or 21 percent of GDP (according to the ESRI). But that doesn’t factor in a ‘redirection’ of investment, which would maintain our asset base. Nor does it count the possibility of leveraging in non-Exchequer funding (public enterprise, private investment, etc.). In the final shake-out, we would find our cash/asset base would have declined by much less – and still be well above the Eurozone average. So we have the money. We have the need. We have the people to do the work. What’s the hold-up? If you tell me we can’t trust this Government to carry out such a progressive programme, I’d agree. But that’s one more reason to hold an election now. And a reason to demand that the Opposition parties clarify their position on this issue – do we invest our way to recovery or cut our way into receivership. It’s pre-budget submission time and IBEC has come out with a barn-stormer. They have all the usual demands we’d expect: more fiscal contraction, no increase in marginal tax rates, maintain our ultra-low corporate tax rate, more spending cuts, etc. etc. No surprises and no indication in IBEC’s submission that evinces either an understanding of the crisis we’re in – hence, the steady-as-she-goes Titanic route – nor much in the way of new thinking. That’s not to say their aren’t some interesting things. But taken as a whole it is one more brick in the deflationary wall – a wall that is close to collapsing on all of us. And that’s the benign part of IBEC’s submission. They reserve the real bloodletting for the low-waged. Let’s look at their multi-prong attack on the living conditions of the lowest paid in the economy. Even before the launch of their submission, IBEC wanted to cut living standards. They called for a pay freeze until 2013. This, alone, would cut people’s income by 3 to 4 percent in real terms depending on which measurement one uses (the EU’s HICP or our own CPI). But in their submission they let their deflationary mojo rip. First, IBEC proposes cutting personal and PAYE tax credits by 6 percent. For a single person this would mean a rise in income tax by €220 a year – for all income earners. This is equivalent to a flat-rate income tax rise. What would the combined impact of a pay freeze and a cut in personal tax credits be? Low and average paid would be hit harder than those on higher incomes – just what you’d expect from a flat-rate income tax rise. This is IBEC’s idea of ‘sharing the burden’. But they’re not done yet. This is IBEC’s idea of ‘we’re all in this together’. And, of course, no attack on the low-paid would be complete without the demand to cut the minimum wage. IBEC doesn’t put a figure on it, nor do they give a timescale but they want to reduce the minimum wage to the EU-15 average ‘over-time’. What is the EU-15 average? In effect, IBEC wants to cut the national minimum wage by 20 percent. Of course, labour costs in low-paid sectors are one of the lowest in the EU-15. But no matter. This is IBEC’s idea of ‘each according to their means’. Cutting pay, cutting disposable income, cutting labour protection - who would be the losers? Well, obviously, the low-paid. That goes without saying (which IBEC doesn’t). But there are other losers which IBEC doesn’t mention as well. The next set of losers would ironically be the business sector itself. The Central Bank estimates that consumer spending will rise by 0.4 percent in 2011- effectively stagnant. With wages being cut across the board in real terms, with the income of those groups who spend literally everything they earn being cut more – what will happen. Less spending, less business turnover and sales – leading to more businesses failing or downsizing; this is IBEC’s idea of ‘enterprise support’. Another big loser would be the Exchequer. IBEC claims cutting personal tax credits by 6 percent would increase tax revenue by €500 million. But when the impact of reduced VAT revenue arising from falling consumer spending; when the impact of higher unemployment costs arising from reduced demand; when the impact of lower business taxes arising from business closures; when all these are factored in, the gain in €500 million will be illusory. The Exchequer could end up in a loss situation. This is why we will all be the losers under IBEC’s attack on the low-paid. What can we learn from all this? We can learn to be like IBEC. That’s right. IBEC is not interested in accommodating its agenda to some make-believe comfort zone of consensus – it is about pursuing its agenda ruthlessly, to ensure that the debate coheres to its logic, its dictates, its demands. So that if there is a new agreement, it will be done its own terms – because they will have bludgeoned their ‘partners’ into an acquiescence dressed up as a partnership. And if there is no agreement, no matter; IBEC will be leading the debate, popular opinion and government policy. Heads they win, tails they win. Yes, progressives and trade unionists have a lot to learn from IBEC. William Slattery of the financial services company State Street, and a member of the McCarthy Committee, has offered some advice to the nation in its time of need. With unemployment climbing ever higher, with 250,000 jobs already shed since the start of the recession, he proposes that the largest employer in the state slash a further 30,000 jobs. Wow. All those numbers going south – what does it mean? William Slattery wants to collapse the domestic economy by over €3 billion - prolonging the recession for at least another year and possible two. William Slattery wants to put more than 40,000 people on the dole queues – and it could be higher if we can’t kick more people out of the country through emigration. William Slattery wants to drive more businesses out of business by cutting consumer spending up to €1.7 billion. But wait a minute – William says we’ll save €2 billion. Is that true? Not even close. The annual deficit will fall by -0.2 of GDP – or about €330 million. Why so little? Because after you factor in the rise in unemployment costs, the loss in tax revenue (income tax, PRSI, VAT from reduced spending), lower businesses taxes from the loss of turnover – the actual savings is peanuts. No doubt William hasn’t thought this through. You cut your total national income by over €3 billion to get a savings of €300 million – if a CEO of a multi-national firm tried to do that with their business, they’d be clearing their desk before noon. It doesn’t bother me that William Slattery makes such an ill-informed proposal. After all, there are people who deny climate change, evolution, and the moon landing; heck, there are people who think the radio makes noise because there are tiny little people inside it. The world is a wide world – there will always be a William Slattery around to amuse and irritate (Eamon Blaney proposes that 100,000 public sector workers be laid off but he was writing in the Sunday Independent, a publication that only exists to facilitate one of the best regular weekly on-line competitions over at Cedar Lounge Revolution). No, what would bother me is if people mistook this proposal as a serious contribution based on an informed understanding of how the real world works. This is a proposal written in crayon on the back of a discarded snickers wrapper in the middle of a kindergarten playground. Pity the nation that takes its William Slatterys seriously. Today on News at One the Minister for Finance mentioned ‘stabilisation’ and ‘stabilise’ a number of times to explain away the 2nd quarter National Accounts report which showed the GDP returning to dive mode. It’s like the captain of sa ubmarine that has just sunk to the ocean floor trying to put a brave face on it by announcing to his crew ‘we’ve stabilised our descent’. Let’s cut to the real nonsense in the interview, though – dangerous nonsense. Minister: ;Well, that is always the danger. But it has to be said that last year after a decline of 10 percent in GNP, a very rigorous budget which removed €4 billion of public expenditure still left the economy stabilised. If the Minister said this because he had to say something in a tight spot, you’d just regard it as another bit of spin. But if he (and this goes for anyone else) actually believes this, we are in deeper trouble than we can imagine. For it is simply not true. In short, the economy would have grown this year by a higher amount if the anchor of these deflationary cuts had not been tied around legs. How much? Using the ESRI multipliers, the Government’s budget last year depressed economic growth by about 1.7 to 1.9 percent. Were it not for the spending cuts, we’d be well back into growth or at least a lot better off than we are now. This is basic economics – spending cuts (and tax increases, especially on low and average income earners) cut growth. That’s its function. At certain points in the economic cycle it is a valid instrument. If the Government had cut tax expenditures to the property market a few years it would have taken some heat out of the asset bubble – in other words, it would have cut the growth in an over-heated property market. I’ll repeat it again: cutting public spending cuts growth. Had the captain not aimed the submarine full speed towards the bottom of the ocean, the crew might not be back at the surface; but they wouldn’t be on the ocean floor, listening to the sound of the hull crushing. As we head into ‘budget season’ we’ll get a lot of nonsense. One of the biggest is that we must extend the ‘tax system’ to those who don’t pay any tax (one Minister described this situation with outrage: ‘50pc of people are not paying a bob of tax. That is not sustainable’). No, the commentators pumping out this line are not talking about the high-income earners who pay as little as 4 percent income tax on their earnings. They are referring to the low-paid – those whose income are so low they are exempt from income tax. Interesting how the phrase ‘pays no income tax’ slides easily into the phrase ‘pays no tax’. This compounds the ignorance of the Irish tax structure. Let’s set one record straight. Ireland relies disproportionately on indirect taxation. It always has. In 2000 indirect taxes made up 43 percent of all tax revenue; in 2008 it made up 42 percent. Given that indirect taxation is more regressive than almost any tax, we should find the Irish taxation system more regressive. It is difficult to measure the impact of indirect taxation on different income groups. Unlike tax or social insurance, it is hidden. We may know how much tax we pay out of our pay packet, we have don’t know how much VAT or excise we pay. A new paper published in the Journal of Policy Analysis and Management puts some new light on this issue. They compare the impact of indirect taxation on different income groups in five countries – Belgium, UK, Greece, Hungary and Ireland. Their findings are provocative but not unsurprising. As can be seen, in all countries the poorest 10 percent pay a far higher percentage on indirect tax than either the national average or the highest 10 percent income group. What’s noteworthy is that the gap between the lowest and highest is greater in Ireland and Greece. This is consistent with the findings of the ESRI and Combat Poverty Agency for Ireland. The paper goes further – combining all taxes (with the exception of social insurance contributions). What do we find? We find what I have extrapolated in the past (using EU – SILC data): that the top decile pays a higher average tax rate – but not that much higher than the national average (the gap is the lowest of all countries in the study) and not disproportionately more than those on low incomes. Compare with Belgium where there is much greater progressivity in the tax system. Though this study was published this year, as part of a microsimulation model of assessing the impact of tax changes in the system, the data they have to rely lags considerably – particularly in the case of Ireland, where the data comes from 2000. This is the problem with so much data – to get at the numbers below the headlines means waiting a long time. I would suggest, however, that though this data lags, it’s still relevant. First, as pointed out above, Ireland has always relied disproportionately on indirect taxes. So it is doubtful that the regressive edge has been taken off of low incomes. Second, high income groups have benefited in the pre-recession years from the reduction in income tax. 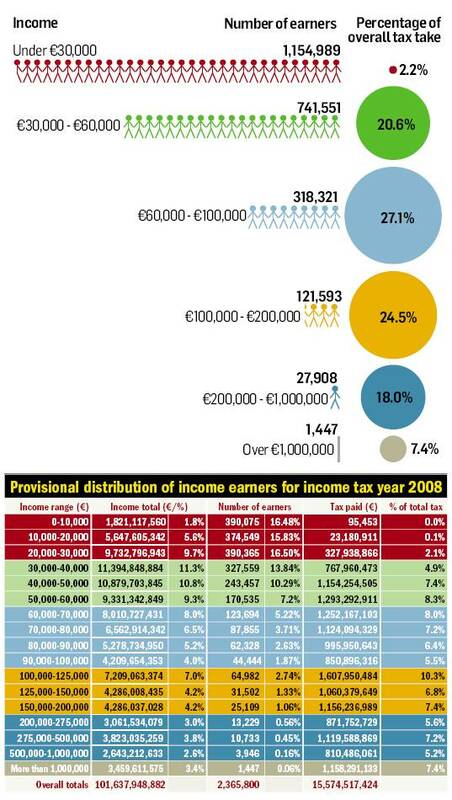 According to the Revenue Commissioners, in 2000, income earners with over €150,000 paid an average income tax rate of 33.4 percent; by 2008 this had fallen to 29.7 percent. Given that increases in income are likely to result in a decline in the percentage paid on indirect taxation, we could find that the average tax rate had fallen considerably by 2008 for the top 10 percent. So, today, with the increase in levies, we may find the situation settling back into 2000 levels. All this to say that any argument premised on the completely mistaken presumption that the low-paid, and low income groups generally, do not pay tax is flawed from the outset. Given that they pay tax (at least 20 percent of their gross income, if not more) the argument must turn on the following. If you increase taxes on those who have a high propensity to spend, how many businesses will close as a result of lost consumer spending? How many more people will be made unemployed from the fall in disposable incomes and, so, consumption? And, as a result, how much tax will be lost – and how much more unemployment benefits will we have to pay – from continuing to hammer domestic demand? In short, do people who advanced this flawed argument know what they’re talking about? One can only chuckle. Last year the pronouncements of rating agencies were treated as though they were written on Mount Sinai. Downgrades, or the threat of such, were interpreted by our high priests of deflation as demands to cut public spending. That’s what we did – big time; slashing public spending by nearly €9 billion in one year (nearly two-thirds more than the McCarthy committee recommended). Surely our sacrifices would please the gods. Now the high priests are confused. Our bond performance kept weakening and the downgrades have kept coming, even after all our fiscal sheep and goats were sacrificed (and earnest assurances that our bank bail-outs are affordable and manageable). So, instead of questioning whether they got the translation wrong, the high priests have turned on the gods themselves. The economy hath no fury like a deflationist scorned. Some of us, however, never treated the rating agencies as anything other than culprits in the international financial crisis. But that doesn’t mean we shouldn’t be worried. Maybe the ‘international markets’ know something that is not being reported here. Take the recent projection of the ESRI. According to the ESRI, if the Government persists with its present strategy our debt as a percentage of GDP will be 106.9 percent by 2020 and rising. With regards to GNP, it will be 134.1 percent and rising. No wonder the Government’s policies are getting hammered. What has been the response? What little there has been shows that old habits die hard. It was suggested that the Government should, maybe, considering cutting €4 billion out of the next budget, not €3 billion as they have announced. Shovel. Hole. Dig. What effect would this have? Hardly any. Using the ESRI’s real growth projections (and taking the consumer price estimates as a proxy for the deflator) I calculate the following. Our general government debt will be approximately €275 billion by 2020. Is anyone really suggesting that cutting an extra billion in 2011 is going to have any impact whatsoever? Even on a static basis, it would only reduce the debt by a couple of percentage points. Actually, it would be less because the impact of the cut would be to slightly reduce economic growth, slightly reduce tax revenues, and slightly increase unemployment costs. Overall, the impact would be a fraction. Cut €2 billion more? Cut €3 billion more? Twice, thrice a fraction still remains a fraction. We are at the end of the road but the deflationary wagon train still keeps going forward. It’s heading towards the abyss. And the problem is that we can’t jump off. Unless we stop the train – and stop it now – we’ll be heading over the edge with it. And no doubt the high priests of deflation will then find a new scapegoat. I nominate the decadent effect of raspberry vinaigrette on modern fusion cooking. For the purposes of avoiding the truth, it works as good as any. There have been some outrageous and hilarious things said in this economic debate. I don’t know how economic historians will come to rank them. But surely at the top must be the claim that the rich have paid a ‘far higher price’ than other groups in society as a result of the economic downturn. You could dine out on that one for a long time. This issue is not academic. In the run-up to the budget progressives will put particular emphasis on increasing taxation on high-income groups. There are two good reasons for this: first, because they have a lot of money and, second, because it will have a less deflationary impact on domestic demand than, say, taxing low-income groups or cutting public spending. But would it be fair? If they have paid a ‘far higher’ price than other groups during the last couple of years are we in danger of victimising this hard-done-by group of individuals? Let’s look through some of the data, bearing in mind that information on income and wealth is sketchy and dated. Pretty grim. Back in March and April we got a lot of commentary – about how the unemployment was stabilising, how we’re starting to turn the corner, how the dismal asphalt of recession is cracking – letting green shoots of recovery to appear. Yes, unemployment remained constant at 13 percent for the two months March and April – down from a peak of 13.3 percent in November last year. But then the great ship Irish Economy started turning south. Unemployment creeped up in June, then July. Now the CSO has released the August figures and, well, they’re grim, now standing at 13.7 percent. A number of commentators have focused on the changing composition of those made unemployed in the last month. While previously it was craft, production and retail workers who took the disproportionate hit, in July there was a substantial rise among professional and clerical/secretarial occupations. In the first six months of this year unemployment in these two combined categories rose by 4,727. In July alone more than 7,800 in these two occupational categories lost their jobs. And women made up 85 percent of that job loss. Why is this happening? One explanation is that a number of companies tried to hold on as long as possible to skilled workers – until they could no longer hold on. The moratorium in the public sector could be another contributing factor. In any event, none of this should be too surprising. FGS predicted that insolvencies would continue to rise in 2010 – spilling out beyond construction and retail, and beyond Dublin. The Insolvency Journal.ie’s recent survey showed this trend continuing. If all this is grim, here’s something grimmer: the jobs recession, even in the best case scenario, will continue until 2020. In reality it will probably last longer. In the ESRI’s high-growth scenario, employment won’t return to pre-recession levels until 2020. In their low-growth scenario (which, in comparison with other forecasts, is more of a medium-growth scenario) it could be as long as 2024. So settle in, ladies and gentlemen – it’s going to be a long decade. Fair dues to the Government. They take old news, an old set of policy projections, repackage it with a shiny new bow, and launch a fresh programme – which is presented as a stimulus and investment-driven job creation programme. And a lot of folk go along with it (though some like Miriam Lord sees the three-card trick being played). Let’s look at the headline figures behind the new capital infrastructure review - for there is spin, but there is (finally) a good news story. The Government announced as early as December last year that capital investment would be cut to €5.5 billion annually from 2011 to 2014. Yesterday, the Government announced that capital investment would come in at €5.5 billion annually from 2011 to 2016. Same ol’, same ol’. Actually, the Government has been taking a hatchet to capital spending projections. In January last year, they projected capital spending to come in at €27 billion for the period between 2011 and 2013. Within a few weeks, this was cut to €17.5 billion. Now it will be €16.5 billion. This is important as here lies a big spin. It is claimed that since tender prices have fallen by 30 percent from a peak in the second half of 2006, the volume of spending and, therefore, the level of activity, won’t be affected. However, the tender index published in the review shows that tender prices have fallen by about 20 percent since 2008. Yet, capital spending in nominal terms will fall by nearly 40 percent. The volume cut is still considerable. Any growth and job creation arising out of the new capital review was already factored into projections last December. Yesterday’s launch doesn’t change those macro-numbers. And capital spending has been cut – whether measured in nominal terms or in volume. So much for stimulus. But let’s look at one set of figures that can help us reconstruct an alternative perspective. The ESRI asserted that capital spending is inefficient when it comes to creating jobs. As mentioned before, they asserted this but didn’t put forward any arguments or data to back up this assertion. They did cite another ESRI study, by Edgar Morgenroth, but this hardly backed up their contention. The Department of Finance measured the job creation element of the programme. They found that there are between 8,000 and 12,000 short-term jobs created for every €1 billion spent (with HSE capital spend having the highest job density and water services having the lowest). These numbers are consistent with Morgenroth’s study. Of course, these numbers don’t include downstream, or induced employment (arising from sourcing, extra demand, etc.). Again, Morgenroth’s study suggests this element – which remains in the medium-term after the project has been completed and the direct jobs are gone – is about half the number of direct jobs created. That would be quite an accomplishment. With some boldness, some vision, some courage (I like using that latter word, since deflationists are forever advising the Government to be ‘courageous’ when it comes to fleecing pensioners, the jobless, the sick and low-paid), the Government could make serious inroads into growth, employment and the fiscal deficit. On the latter, the Morgenroth study quotes Construction Industry Federation numbers showing that – adjusted to our sample €3 billion extra boost – tax revenue would rise by about €900 million with a further €900 million saved on the social welfare budget. That’s a big turnaround – and probably doesn’t include further tax revenue arising from increased consumption. So capital spending can be a useful instrument in terms of job creation and the fiscal deficit. But the real benefit is the long-term addition to our economic base. For instance, IBEC estimates that installing a Next Generation broadband network to cover 90 percent of all household and businesses would cost €2.5 billion – with about two-thirds of that cost composed of civil engineering works. If such a project were undertaken, we’d get a jobs boost and a public finance boost. But we would have an extremely valuable asset on the national balance sheet, an asset that would facilitate indigenous enterprises’ ability to compete in the traded sector. In other words, the good stuff would keep coming. All this to say that, beyond the spin, investment works. It puts people back into jobs, it helps repair the public finances and it can leave us with wealth-producing assets for years to come. Now, isn't that a good news story? Brian Keegan from the Chartered Accountants Ireland says that finding €500 million in tax revenue for Budget 2011 will be ‘very difficult to find’. There are no easy choices, he writes in the Sunday Business Post. He does flesh out two ideas – a flat-rate property tax which could raise €500 million and a reduction in personal credits which could raise €300 million. In the former, someone owning a one-bedroom terraced house would pay the same amount as Denis O’Brien’s crib on Shrewsbury Road. In the latter, an ultra-low paid worker on €9.50 an hour would suffer a tax rise of €14 a week; an income-earner on €100,000 a year or more would suffer a tax rise of . . . €14 a week. Of course, such tax increases as Brian suggests will so hammer demand that tax revenue will dive and unemployment will rise – leaving us little gain (which is one of the reasons why Moody dumped on our bond ratings today: sluggish growth). First, apply the Health Contribution Levy to rental and dividend income. This would bring in €89 million according to Fine Gael. Second, apply PRSI and other income levies on capital gains, inheritances and gifts. This could bring in up to €290 million. Third, apply PRSI to executive share options. This would raise €29 million according to the Commission on Taxation. If share options are exempt from the income and health contribution levy, apply them. This would bring another €29 million or so. Fourth, remove the employers’ PRSI relief on pension contributions made by employees (currently, employers’ get this relief even though they make no pension contribution themselves). Fine Gael says this could raise €185 million. Fifth, abolish the PRSI contribution ceiling. This would raise €120 million. So, five simple proposals that would raise over €700 million. And we haven’t even looked at income tax and business taxes (all those tax breaks that do nothing for the economy but line the pockets of high income groups). All we’ve done is applied a simple proposal – that all income, regardless of source, should be treated the same. No new taxes, No hit on low and average income earners. So there are easy options. The difficult ones – for the economy and for households – are when you hit the living standards of those who can least afford it. If you go down that route, all you will end up doing is lengthening the recession into next year. And give Moody’s another excuse to downgrade our ratings. I have to admire those who claim we must bring the low-paid into the tax net. I admire their chutzpah, their audacious willingness to flaunt in public their remarkable ignorance of the tax system. For the low-paid are already in the tax net – big time. Let’s go through the arguments and see if those making these claims are agenda-driven or just badly misinformed. First, nearly half of all tax revenue comes from indirect taxation – VAT, excise, etc. In 2010, 47 percent of all our tax revenue will come from these sources. Ireland is somewhat unique in the EU for its over-reliance on indirect taxation. In 2008, the latest data year, indirect taxes made up 34 percent of all taxation in other EU-15 countries; in Ireland it made up over 42 percent. Second, indirect taxes are highly regressive. The ESRI-Combat Poverty Agency found that households on the lowest incomes – the poorest 10 percent – paid over 20 percent of their gross income (social welfare, work income, etc.) on indirect taxation. Households on the highest income – the top 10 percent – paid 9.6 percent. While this data is somewhat dated, the proportions are still relevant; after all, taxes on consumption are regressive throughout the EU and the US. Let’s pause here for a moment. In our biggest tax revenue stream old age pensioners living alone, lone parents, the unemployed and disabled, casual workers, part-time minimum wage workers pay more than twice the tax ratio as those on the highest income. Hmmm. And yet, we have commentators urging the Government to take the ‘bold, courageous’ decision – and bring the low-paid into the tax net. Hmmm. This tax avoidance is due to the proliferation of tax breaks. We have to be cautious about putting two different studies together (different methodologies, different source data, etc.). However, if only as an exercise, let's combine the ESRI-Combat Poverty Agency study with the Finance survey, We still find that that the poorest in society pay a higher tax ratio than many making hundreds of thousands of Euros a year. The Government tightened up slightly the ability to avoid tax in the last budget but it will be interesting to see what numbers the next tax survey produces (even so, none of this includes income streams which are exempt such as income from woodlands profits, artists, etc.). The issue therefore, would seem obvious: how can we bring the highest income earners into the tax net, how can we increase the tax ratios of high income groups above that of the unemployed and the low-paid. Then there is the economic ignorance of arguing for hitting low income earners – whether that hit comes via increased taxation or reduction in income supports. What happens when you hit such groups? You reduce consumer spending which in turn reduces tax revenue, hits domestic business which in turn reduces payrolls (either laying off staff, cutting hours, cutting wages) which in turn cuts revenue even more while increasing unemployment costs. Of course, our economic ignoarti don’t get this simple ‘1-1-1 = -1’ equation. They keep shouting for more courage, more boldness, more ‘tough-love’ policies - without the love, of course. And when consumer demand falls by more than 10 times the Eurozone rate, when tax revenue collapses, when employment keeps falling – what is their response? Hole-shovel-dig-more. So are such policy demands based on misinformation, laziness (looking up facts to back-up one’s argument can be such a drag) or plain ideology? Is there a connection between the demands to ‘bring the low-paid into the tax net’ and the warning that ‘if we tax high-income groups too much they’ll (a) leave the country, (b) go on an investment strike, (c) have a hissy fit, etc.’? I’ll leave that to you. Whatever the reasons, the demand to increase taxation on the low-paid is a recipe for further bleeding the economy of demand – a low-growth, high-debt future in which unemployment will remain high, poverty will grow and the proceeds of any minimal growth will be concentrated among high income earners. It’s time we got a bit angry about all this. The CSO has just published the first quarter National Accounts. If you want to avoid the spin go straight to Michael Burke's cogent analysis on Progressive-Economy. Here I just want to look at one long-term development - a very concerning trend relating to the very structure of the Irish economy; namely, the growing gap between GDP and GNP. As everyone knows by now, GDP includes multi-national activity which acts like an economic souffle. Put a fork in it, take out profit repatriation, and we end up with the GNP which is usually proclaimed to be the true economic measurement for Ireland (I believe this to be a bit simplistic but let's take it as read - it's closer to the truth than the GDP figure). The problem we are facing into is that the gap between GDP and GNP is growing. The headline figures are becoming more detached from the concrete economy. This is not just an academic juggling of numbers. For instance, our deficit, for the purposes of the Maastricht criteria, is measured against GDP. Using the Government's own projections, in 2009 the deficit was projected to be -11.7 percent of GDP (ex-Anglo subsidy); however, when we use the more relevant GNP, the deficit jumps to 14.5 percent. In other words, the deficit is more of a burden on the economy than the headline numbers suggest. Or take income per head: if we use GDP per capita we're still a rich nation, even in 2010. We rank 3rd, behind Luxembourg and Denmark. However, if we use GNP per capita we slide all the way down to 10th. And if you really want to get depressed, if we use PPS measurements (to even out living standards), we are hardly wealthier per head than Greece, Spain and Italy. No wonder that Davy Stockbrokers mocked the idea that we could call ourselves a wealthy society. All analysis, all prescriptions, all policy must be grounded in realityh. So the gap between GDP and GNP should be of concern. So how's that gap going? In 1995, the gap was 11.6 percent. By 2005 that gap had grown to 15.4 percent. It's been growing eve since. Since we entered the recession, the gap has been growing in leaps and bounds. This suggests that whatever about the activities of the multi-national sector - and much of it is tax-accountancy motivated - the GNP continues to fall behind. Even the Government admits this, projecting the gap between GDP and GNP will grow to 21,5 percent. On current trends, however, this could be highly optimistic. Even so, the Government projects that GDP will grow by over €40 billion between 2009 and 2014; GNP is projected to grow by €29 billion. That's a considerable difference in terms of growth, tax revenue and unemployment costs. Not much good news here. Adrian Weckler is doing what journalists should be doing – investigating stories rather than report press releases. We have, of late, been subjected to an avalanche of job-creation announcements. Take one example: Weedle, a Dublin-based company that marries recruitment with social marketing; Minister Batt announced 50 new jobs from this company. Adrian decided to look behind the Departmental press release and found a bit of spin. The fault here does not lie with the company (they are, after all, going about the business of creating new business) but with the spin put out by the Government, where '50 new jobs' is actually 31 and only if everything goes right. This begs broader questions – not just of spin but of the employment projections the Government is using. They have projected net new job creation to be 1 percent, or approximately 20,000 net new jobs, in 2011, rising to 2.3 percent, or over 40,000, in 2012 and in each of the two following years. That’s 140,000 net new jobs over the next four years. Of course, that means a much higher gross job creation rate as these are net figures, taking into account job losses. How realistic is this? If we look at the employment creation record since 2000, we might choose to be sceptical. Close to half of all jobs came from two sectors. When these are excluded, we find that the annual job creation rate was substantially reduced - to less than 34,000. However, this only tells part of the story. Outside the construction sector, there was substantial job creation still dependent on the property boom: surveyors, architects, real estate agents, mortgage brokers – and associated clerical positions; building suppliers, transport, and other business services. Then there were the jobs created because of the increased consumer spending arising from the property boom/public sector employment; retail for example. And let’s not forget the jobs that were created by Government consumption – purchases of goods and services from the private sector. It’s hard to break this down but thousands of extra jobs were dependent on conditions that will not return. The Government intends to reduce public sector employment by anything between 10,000 and 15,000 up to 2015. Instead of jobs growth, there will be jobs retrenchment. Nor should we expect substantial growth in the construction sector – not only because housing starts will remain sluggish, but because the Government intends to cut capital spending in real terms up to 2014. According to the FAS/ESRI employment projections, construction will have 63,000 fewer jobs in 2015 than it had in 2008. In addition, the Government intends to cut its consumption by ½ percent each year up to 2014 – meaning fewer jobs in private sector companies that previously benefited from such consumption. When we consider different sectors, we see either losses or flat-lining. Again, according to the FAS/ESRI projections, there will be lower employment in the agriculture (30,000 less in 2015 than in 2008) and traditional manufacturing sectors (40,000 less). The Ernst & Young/Oxford Economics survey projected that we wouldn’t return to pre-recession job levels until 2022. Even on the Government’s own highly optimistic projections, we won’t return to pre-recession levels until 2017 but those numbers look ever more problematic when the details are examined. So the question arises – where will the jobs come from? Unfortunately, we are getting no answers – not ones that will satisfy the needs of all those people who will need to find jobs: school and university leavers, the unemployed, those currently under-employed and marginally attached to the workforce and the thousands who have been forced into non-participation for lack of work opportunities. Instead, the Government actually wants us to believe that employment creation will be higher in the next few years than it was in the earlier part of the decade when money was cheap and we actually suffered from labour shortages. All we are getting is spin – aspirations and numbers that don’t add up. We don't deserve this. Davy Stockbrokers nailed it: we’re not wealthy now, we never were. Though we had years of high income, private investment in the productive economy was ‘pitiful’, opting instead for property and construction. While productive public sector investment was higher, it was squeezed by fiscal policies which cut taxation – especially for those on high incomes who didn’t invest properly. With public investment being slashed in the years ahead, we’re not going to be wealthy anytime soon. But for a while the economy was rolling in it. While Davy was referring to wealth (capital stock), let’s look at incomes as measured by GDP per capita using the PPS measurement and chart our money roller-coaster (Ireland in GNP). Whatever about the larger debate over which measurement to use – GDP or GNP – it is clear that the latter measures how much money we are left with after capital flows. In 1995 as the Celtic Tiger boom, fueled by multi-national investment and job creation was just taking hold, Ireland was the third poorest country in the EU-15. We even ranked behind Spain in terms of GDP per capita (PPS). However, we were starting on our roll. Exports were growing exponentially, employment was rising rapidly, emigration was ending and incomes were rising. It was only a matter of time before we started heading up the charts. By 2000, Ireland had nearly closed the gap with the EU-15. We had gained on the table leaders and significantly widened the gap with the poorer countries – Greece and Portugal. By now, though, the speculative economy was taking hold. Attempts to create a strong indigenous enterprise base and organic linkages with the multi-nationals (i.e. Irish companies supplying multi-nationals with goods and services) were floundering. The economy continued to grow – in excess of EU averages – but not at the same rate as the first phase of the Celtic Tiger boom and certainly not in a sustainably way. But the few who pointed this out were laughed out of the court of public opinion. And why not? According to the numbers, on the eve of the recession, we were rolling in it. We surpassed the EU-15 and now ranked 2nd behind the Netherlands. The days when we were skimming the bottom was a long time ago in an economic galaxy far away. But as we have learned, the numbers were badly misleading. Ireland was more damaged by this recession than any other EU-15 country: collapsing output and employment, exploding deficits, burned out banking. And let’s not forget, a Government that didn’t know what it was doing – either in 2000 or in 2008 (or, rather, a Government that couldn’t think beyond a low-tax). So where are we going to be by this time rollercoaster hits bottom? Not in a very good place. The EU Commission projects that Irish income per capita will fall back below the EU-15 average. In addition, the gap between Ireland and the poorest country – Portugal – will be close to where it was in 2000. In just a few short years we have fallen from the heady heights of second place. It can be argued that all the comparative gains we made since the beginning of the decade were wiped out. Not only were we never a wealthy country, when we had the money we blew it. But who blew it? To whom did this money to flow to? How many of us shared in the high-income times? Relatively few – as we will see in a subsequent post. Monday night’s Frontline discussion was an object lesson in how to miss the point – a really big point in a really big way. In discussing spending cuts we were treated to all sorts of suggestions – from getting rid of Minister’s drivers to shaving departmental estimates; all with a view to saving a few bob. Thankfully, almost all participants were agreed that old age pensions should be exempt from cutbacks (though the Government representative did leave open the possibility of cutting back on ‘millionaire pensioners’ however few they may be and how little would be saved after the administration of a means-test). In essence, we were treated to the spectacle of great white fiscal hunters chasing down mice, while the elephant stood beside them – unnoticed, unremarked upon, unharmed. No one mentioned the cost of unemployment. No one mentioned anything about reducing the cost of unemployment. This is a substantial cost, spilling over into adjacent line-items and throughout the balance sheet. It imposes all manner of economic costs which can be measured, and social costs which we are not so amenable to the slide-rule, but costly nonetheless. Let’s take a road trip through the valley of the unemployment elephants. First stop is the actual cost of unemployment supports. The 2010 estimates show that Jobseekers’ Benefit and Allowance will cost nearly €4.5 billion, more than doubling since the onset of recession. But this is only the start. Many unemployed take social welfare payments through other categories – Lone Parents, for instance. One Family showed that over 60 percent of those on Lone Parents Allowance wanted to work but couldn’t find a job. When many recipients exhaust their Jobseekers’ Benefit they go on to or return to the Lone Parent scheme. We will also find unemployed on Pre-Retirement Allowance – essentially a scheme for over-55s who have little hope of finding work. In addition, those who have only been marginally attached to the labour force or waiting for their payments to come through might themselves in Supplementary Welfare Allowance. And then there’s the cost of redundancy payments – which have doubled over the last three years. Second, there are a range of secondary supports for the unemployed: rent supplement, mortgage interest supplements, exceptional and urgent needs payments, back-to-school allowances, fuel allowances, etc. There are supports from other departments, most notably medical cards; others include school books grant scheme. Third, there is a range employment supports – programmes designed to get the growing number of people back into work: back-to-work allowances, back-to-education allowances, etc. We might include here community supports – funding groups trying to deal with the fall-out of growing unemployment (though, to be fair, the Government is desperately cutting back on these pesky mice). Fourth, is the growing demand on public services, in particular the health sector: unemployment creates higher susceptibility to malnutrition, illness, mental stress, and loss of self-esteem, leading to depression; poor health outcomes stretch into later life such as heart attacks, etc. Alongside this are costs associated to the relationship between unemployment and social degradation – crime, vandalism, environmental damage. All these drive up costs. Fifth, let’s not forget the administration of this growing ‘client’ sector – the public sector workers who pay out, ensure compliance, etc. More unemployed mean more workers servicing them. So when we factor all these in, we will find the direct costs of unemployment well above the headline line-items. But we haven’t yet reached the bottom of the valley. Taxation: unemployment leads to loss of tax, constituting a fiscal double-whammy. Given that the deficit has been driven by a collapse in taxation, this is of particular importance. It’s not just income tax; there’s income levies, Health Contribution levies, VAT and Excise. And it’s not just taxation: there’s social insurance – employees’, employers’ and self-employed PRSI. With the Social Insurance Fund in deficit, this imposes a new cost on the Exchequer – subsidising the Fund. Loss of Demand: Unemployment reduces demand in the economy. Less money spent means less profit means less business taxes. This has a number of knock-on effects. If a business closes down from loss of demand, it means loss of rates for the local authority. If a business stays open, it may have to cut back on its employees’ wages or hours: less tax and PRSI revenue, less VAT/excise because the employee can’t spend as much. In turn, the business struggling to survive cuts back on purchases (destocking, etc.). This in turn reduces the output of suppliers. The cycle turns further downwards as suppliers cut back on their employees’ wages or hours. Further loss of demand comes from those not ‘officially’ regarded as unemployed – those whose Benefit has run out but fail the means-test for assistance. Emigration has the same effect. Wages and Incomes: Unemployment keeps wages low. Low wage growth results in sluggish tax and social insurance receipts. This keeps pressure on demand. At the extremes, employers play hard-ball – especially in the hospitality sector, demanding that workers take pay cuts below the JLC rates, work overtime and holidays for free, etc. All this contributes to further demand loss and costs. In addition, a study carried out in Britain found that a spell of unemployment carries a wage penalty of 6 percent on re-entry and after three years, earnings were 14 percent less compared to what they would have received absent unemployment. Slides in income will feed back into rising welfare costs as people may find themselves eligible for Family Income Supplement. Investment and Job Creation: All this will impact on investment – businesses won’t invest in a sluggish climate with little hope of recouping their outlay. All this will delay job creation which in turns keeps unemployment costs high with all the negative impact on tax, demand and income going forward. Take all these together – the direct, social and wider economic costs – and the outlay on unemployment is in the billions squared. But did any of this make it into the discussion on Frontline? The biggest public expenditure item? The biggest revenue loss item? The biggest economic cost item? Did we get any bold, imaginative (or in the words of the orthodoxy - 'tough', 'courageous') proposals for creating jobs, creating investment, creating growth and, so, reduce the biggest cost item on the Government's balance sheet? No. All we got were great white fiscal hunters bringing home trophy mice. All the while, the elephants of unemployment are running amok in our national china shop, smashing up the place, leaving us with nothing to buy or sell. Our great hunters don’t want to know. We are not Spain, we are not Italy, we are not Portugal. Repeat. We are not Spain, we are not Italy, we are not Portugal. In one sense, that’s correct. In terms of the ‘market’ view of the Irish economy, we’re worse. But don’t expect commentators who have been demanding public spending cuts to point this out; it would undermine their arguments. The smaller the spread, the more markets are pleased. The larger the spread, the more markets are angry. The 10-year bond spread was presented as the ultimate portal into the collective mind of the market. During the Euro crisis, when bond yields were soaring, we were told we were not like the other periphery countries. Our deflationary interventions in 2009 – when billions were ripped out of the economy through spending cuts and tax increases on low-average income earners – had ‘pleased’ the markets. Therefore, while the debt of other countries were under attack, ours was safe. To make this argument work, though, you have to ignore the 10-year bond spread – the very index that was used to justify deflationary policies in the first place. Why is this crucial index now being ignored? Because after all the deflationary measures Fianna Fail imposed, the markets still tore strips off Government debt in the recent crisis. It’s not just that the markets were not pleased; if anything, they were even angrier. Those who demanded deflation don’t want you to know that. Therefore, don’t present the data and hope that people won’t notice. Let’s correct this. I have taken, from the Financial Times Bond Index, the average spreads of both the periphery countries (Spain, Italy and Portugal) and the ‘core’, or non-periphery countries (all other countries in the EU-15) and compared them with Ireland. I have excluded Greece since they are not in the market anymore. Let’s see what we find. It would really help if some analysts took the time to read the reports they comment on. Take the EU Commission’s recent Spring Forecast - there was a titter of excitement that the EU revised upwards its projections for Irish growth (from its Autumn Forecast published before the last budget). Surely this, along with recent Exchequer returns, Live Register figures and the Retail Sales Index, shows that not only have we troughed, but we are back into growth mode. QED: the government’s policies are working. However, beneath the GDP headline figures, the EU’s projections should give us some concern for worry. We’ll come back to the GDP numbers but let’s do a brief tour of other important economic indicators. The EU actually revised GNP growths downwards – and their projections for this year make for depressing reading. In 2010, the EU is projecting the GNI (GNP plus EU net inflows) will decline by -2.8 percent, compared to -2.6 percent prior to the last budget. The same for 2011: the EU revised GNI downwards, coming in below the Government projections. This is part of the emerging two-tier economy narrative; a growing multi-national sector whose exports, which are neither tax-rich or job-rich, are driving GDP. But take away the repatriated profits and we find growth in the domestic economy falling behind. The EU revised downwards their 2011 projections for investment. Whereas pre-budget they estimated investment to grow by 5.1 percent, they now project a 4.2 percent increase. Once again, the EU revised downwards 2011 projections for consumer spending. Pre-budget, they estimated private consumption to rise by 2.1 percent. Now, they’re projecting 1.4 percent. We’re still in downward territory. Regarding employment, the EU projected an increase of 0.7 percent prior to the budget (or about 14,000 net job creation). Now they’ve reduced this to 0.4 percent (or about 8,000 jobs). The ESRI has gone further, projecting no employment growth at all in 2011 (the Government is banking on 20,000 net job creation). This resulted in the EU revising their unemployment projection upwards from 13.2 percent to 13.4 percent. Don’t be surprised: the EU has revised wage growth downward. Prior to the budget, they estimated that compensation per head would rise by 1.1 percent. Now they project a 0.8 percent. So let’s return to the GDP figure that commentators seized on as vindication of the Government strategy. Yes, the EU revised it upwards, based primarily on revising export growth upwards – from 3.7 percent to 4.3 percent. But there are two major caveats which were referred to in the three-page country summary. In other words, the EU may revisit their GDP figures (and other indicators), depending on which deflationary option the Government alights on. Second, the EU projected an increase in Government consumption of 2 percent in 2011 (public sector payroll, purchases from the private sector, etc.). This is an extension of the ‘no-change policy’ formula regarding the fiscal adjustment mentioned above. However, the Government has made it clear it intends to cut its consumption in 2011 by -0.5 percent. This will impact on overall GDP growth. Factoring in this cut (and this is only my own back-of-the-envelope job) the EU may have to revise their GDP growth downward by about 0.3 to 0.5 percent. The point is that the EU, in its commentary, made it clear their GDP growth projection was provisional and based on only partial information. To conclude, the EU revised most of the major economic indicators downwards but you won’t find this mentioned in most, if any, commentary. The one figure that commentary did seize on – GDP – was provisional only. In any event, a big story – the divide between the multi-national driven portion of the economy and the domestic economy (the GDP/GNP divide) - was totally missed. When analysts don’t actually read the report they’re commenting on, or don’t get it, or gloss it over, or just plain ignore it (because it doesn’t fit the prevailing consensus) – well, no wonder we’re in the mess we’re in. Because the debate is in a mess. then no wonder the economy remains mired in an economic and fiscal crisis. Fianna Fail has not looked after unemployment; the budget has not looked after itself; no one is looking after the economy. How does Irish employment fare in comparison with other EU countries over the three years of the recession (2008-2010)? The recent EU Commission's recent economic forecast provides some depressing numbers. The collapse in employment in Ireland has been little short of staggering. In the entire EU-27, Irish employment has fallen, in percentage terms, more than any other country save for Latvia. It has fallen at five times the rate of the Eurozone. In other words, the deficit would be consdierably lower. Of course, even without the global downturn, Ireland would have had a property bust, resulting in considerable job losses. The growth in construction employment was ultimately unsustainable – rising from 9.7 percent of total employment in 2000, to 13.7 percent in 2007. Factoring this in, a fall in employment consistent with the Eurozone average (including the fall-out in construction from the property bust) would have been a little over 6 percent – still less than half of what we have experienced. Were other Eurozone countries just lucky to escape a dramatic fall in employment? No, it was policy; a policy that understood that maintaining employment is key to surviving a recession, key to maintaining fiscal integrity - key to shortening the duration, and limiting the damage, of a recession. That’s why other countries took steps to increase public investment, launch job-retention schemes, maintain demand (increase the minimum wage, cut VAT, etc.). Fianna Fail didn’t take employment seriously. Now we’re paying the price. What can we look forward to? The Government is bullish. In 2011, they are projecting a net increase in employment of 20,000. What do some other forecasters say? The ESRI is projecting no net increase. The EU Commission predicts employment will grow by approximately 7,000 (but that is on a no-change fiscal policy basis; measures in the 2011 Budget that dampen demand could result in a downward revision). Ernst & Young predicts that unemployment will remain in double-digits up to 2014 and probably beyond. If the Government is wrong (and Batt O’Keefe’s detached-from-planet-earth aspirations don’t materialise), then employment will stagnate until at least 2012. This will result in sluggish tax revenue, continuing high levels of unemployment expenditure, with all the fall-out on the deficit and debt levels that this entails. All this because the Government didn’t follow the dictum from someone who know a little bit about depressions and how to get out of them. An economy relying on consumer spending to drive a recovery is an economy that will be eventually be disappointed. Not that consumption cannot play a vital role. Indeed, businesses dependent on domestic demand need a robust level of spending to survive and expand, invest and employ. But it must always be placed in context. For headlines numbers may look good but hide deep flaws in the economy – flaws which we know all too well will not remain hidden for long. E&Y projects GDP growth to be 13.8 percent; the Government is projecting 17.1 percent. May not seem like much but this undershoot will produce continued deterioration in other economic and fiscal indicators. Unemployment will remain high according to E&Y. By 2014, they project joblessness will remain close to 2009 levels: at 12.1 percent. The Government is hoping it will fall to single figures (9.5 percent). That’s a significant and depressing gap. E&Y is one more forecaster to predict the Government won’t reach the 2014 Maastricht guideline target. They predict we will still have a deficit of -4.6 percent. More alarming, E&Y projects overall debt levels will be over 95 percent of GDP. The Government projects they can hold the line at below 81 percent. The difference between these two points to higher debt servicing costs that will soak up ever more limited resources. This is all of a piece – low growth, high unemployment and growing debt. However, just as concerning is the degree to which growth will be reliant – not on export growth or investment (though E&Y sees investment rising higher that Government projections in 2011/2012) – but on consumer spending. Under Government projections, consumer spending will make up 40 percent of GDP growth between 2010 and 2014. However, under E&Y projections, consumer spending will make up 50 percent of a much lower GDP growth. A related, and vital issue, is who is going to be spending. This is something that neither set of projections addresses and, admittedly, it would be difficult (though not impossible) to model this. However, if we find that Ireland continues on its merry unequal way, higher consumer spending will have a less beneficial impact on the economy. That Ireland has high levels of income and wage inequality is incontestable and is cogently summarised by the joint ICTU/TASC HEAP report. If this trend continues in the future (and given that it is working class, rather than professional occupations, hat have taken the hardest hit, this is likely), then we will see consumer spending driven by higher income groups – groups that tend to consume import-intensive products (cars, durable products, etc.). This will have a less beneficial impact than spending by low-average income groups which tends to be less import-intensive. Two, consumer spending driven by groups whose spend will flow out of the country, with less benefit to the indigenous economy. This will contribute to a low-growth, high debt scenario. Of course, none of this gets an airing. The Government is obsessed by headline rates that directly impact on the fiscal crisis (and they continue to miss those targets) while others are rushing to ‘return to normal’ scenarios that gloss over these inconvenient issues. Ultimately, sustainable growth will emerge out of a combination of high-levels of investment (which, as the Davy report shows, will be driven by the public sector or won’t be driven at all); expansion of our indigenous base – through both public and private sector activity if we’re going to be pragmatic; and carbon-reducing strategies. Consumption has an important role to play in this mix but only if it is results from a redistributive process whereby spending by higher income groups is limited through taxation while incomes at the lower level are enhanced. But in terms of the debate, never mind policy, this is exactly where we’re not at. There’s a problem with the way reports are covered in our media. Take the recent ESRI Spring Quarterly Commentary, for example. The demands on journalists to cover a statistically-dense 85 page report for the next news bulletin or the next day’s paper means that they can’t possibly work their way through it to get a sense of the wider narrative. And by the time they do, it’s yesterday’s news. So just some quick points you might have missed. 1. The Annual Deficit: big issue since reducing this is the primary, if not exclusive, obsession of the Government (it sure ain’t unemployment). The Government wants to reduce the deficit marginally this year – from -11.7 percent to -11.6 percent. This would show that they have the ‘troughed’ the deficit’s decline. The ESRI throws cold water on this. They show that the deficit will continue to deteriorate. They project it will fall to -12 percent. Not much different except that it’s going in the wrong direction and that it will hit a highly significant number. Don’t forget, the Government introduced the April emergency budget out of the fear that the deficit would exceed -12 percent. So, if the ESRI is right, we’ll be there 18 months later. Anyone notice? 2. Overall Debt: another big issue since higher debt means higher interest payments which means a greater burden on the economy. The Government is projecting overall debt to be 83 percent of GDP by 2011. The ESRI projects a much higher number – over 89 percent. That is really going in the wrong direction and could result in increased expenditure of over €250 million a year in debt servicing. Anyone notice? 3. Employment: a few weeks back you couldn’t open up a newspaper without some government agency promising thousands of jobs coming on stream. This was led by the Minister for Finance who stated unequivocally that there would be a net increase of 20,000 jobs in 2011, followed by years of 40,000 job growth. The ESRI, however, projects that the job increase for 2011 will be . . . 1,000. The cost of this difference, according to Department of Finance estimates, would be €475 million a year in extra unemployment costs and lost tax revenue. Anyone notice? 4. GDP Growth: much attention was given to the ESRI’s projection that the economy would start growing later this year (it was hardly a new projection; they and other independent forecasters have been saying this for some time). The ESRI’s projections for this year are more optimistic than the Government’s. However, by 2011 the ESRI projects a lower growth rate than the Government (2.5 percent as opposed to 3.3 percent). This will mean lower tax revenue and higher unemployment costs as the economy remains sluggish. Anyone notice? 5. GDP Levels: not only are GDP growth projections lower than the Government’s, the ESRI predicts that the size of the economy will be significantly smaller in nominal terms. In 2011, the Government hopes GDP will be nearly €170 billion. The ESRI, however, projects a much smaller size - €164 billion. If the tax/GDP ratio holds, this will mean over €1.1 billion less in net current revenue (and that doesn’t count lost PRSI revenue). Anyone notice? The Minister claimed that the ESRI report vindicated the contention that we had turned the corner. Maybe so. But we’re turning into a cul de sac. Higher deficit, higher debt, lower employment, lower growth and lower national income – the ESRI report actually vindicates what the TASC open letter described as a ‘low-growth, high-debt’ future. You thought the economic decline was bad? Wait for the recovery – joyless and jobless. We either change the game or resign ourselves to it. The latter course is easy. We can veil our resignation in all sorts of good intentions and sincere aspirations. The former course, however, is fraught with danger – failure, ridicule (by those who like the game as it is) and the treading on to new, untested ground. It takes political courage and vision to succeed in the latter; it only takes political savvy to succeed in the former. That is the gist of Vincent Browne’s provocative article in the Irish Times today. He sets out a challenge, a game-changing challenge, to transform the political landscape. In short, he calls for Labour – and by extension all progressives – to reject the dismal game being played out today; that Irish politics must always and inevitably be a choice between Fianna Fail and Fine Gael. He calls for Labour and progressives to embark on a new course. And to do so together. Now the Government is busily rewriting this. Apparently, the agreement is no longer subject to currently unforeseen budgetary deterioration. Indeed, to even refer to the Government’s clause is now considered to be irresponsible. There is a good reason why the Government is busily rewriting the agreement. For whatever about the ‘unforeseen’ part, there is little doubt that the budgetary situation is deteriorating. And Ministers are getting a bit touchy about this. The Government is projecting the deficit this year to come in at -11.6 percent – only fractionally lower than last year. Maintaining this level is crucial both economically and politically; slippage would call into question the very premise of Government strategy. .
Slippage 1: In the last few weeks the CSO recorded GDP levels more than €1 billion below the Government’s projections published in December. In addition, on foot of the recent Quarterly Household Report, unemployment figures were revised upwards from – 12.6 percent to 13.4 percent. Out of all this, last year’s deficit has to be revised downwards again –from -11.7 to -11.8 percent; admittedly marginal, but downwards nonetheless. Slippage 2: After the first three months of this year, the Government is already off-target. By March, tax revenue was -3.6 percent below target, down from February’s undershoot of -1.3 percent. The Government expected tax receipts this year to be €2 billion below last year’s level. In the first quarter alone, tax receipts are already €1.2 billion under target. The slippage is getting slippier. It’s not just that the Government’s strategy is coming under internal pressure, it’s also getting a wallop of external pressure. The EU Commission in its most recent statement on Irish public finances has warned the Government that (a) its growth projections are too optimistic, (b) expenditure will over-run, and (c) it will have to engage in ‘additional’ consolidation measures (more spending cuts/tax increases beyond what the Government has already projected). Even if the Government comes in on target, the EU Commission wants Ireland to ‘consolidate’ further to bring down overall debt levels. The IMF also gives the Government similar warnings and argues that the Government must cut spending even further if it is to bring the deficit below -3% by 2014 (the Maastricht guideline). The final straw on this deteriorating camel comes from the Central Bank. While much attention was paid to their projection that the economy will return to growth by the second half of the year, some of the fine print was glossed over. Namely, that GDP will be well below the Government’s projections – by nearly 3 percent by 2011 in nominal terms. This will put even more pressure on the deficit. All this will lead to ‘budgetary deterioration’. How much is hard to say but there are certain symbolic targets. For instance, the Government is projecting a small decline in the deficit this year. If it actually worsens – no matter how much – the optics will be bad. If it goes beyond -12 percent, it will look particularly bad. That this is certainly possible can be seen from the Bank for International Settlement’s projection of a deficit of -12.2 percent for this year. It is doubtful that such a slide would result in the Government tearing up the agreement if it is accepted (though this cannot be ruled out). But what it would certainly mean is that there would be little chance of reversing any pay cuts in 2011. No wonder that the Government wants to shift the goalposts of the agreement by redefining ‘deterioration’ as ‘another financial crisis’ (does Quinn count as such a crisis?). They hope that it will take everyone’s mind off the actually existing deterioration and the thin to non-existent chance of any pay claw-back. It is the ultimate in ostrich-like indifference to the reality around us. The Government may want to find a soft bed of sand to stick its head in – that doesn’t mean we have to. In a previous post we saw that public sector labour costs are below-average by EU-15 standards. The argument that Irish public sector workers are ‘over-paid’ in relation to their European counterparts holds no water whatsoever. However, that doesn’t answer the charge that, regardless of comparative costs, we just have to cut public sector wages because of the fiscal crisis. No matter how unjust it might seem, public sector workers’ must suffer cuts in living standards so that we can bring the fiscal deficit under control by 2014. The truth is that cutting the public sector payroll will have almost no effect on the fiscal deficits, while at the same time being economically damaging. Indeed, it might end up actually increasing the deficit burden. How does this work? A simple, slide-rule approach might suggest that cutting €2 billion will reduce borrowing by €2 billion. This is our experience at the household level. When our spending exceeds income, we cut spending to stop the cash-flow deficit. We stop eating out, turn off lights in unused rooms, buy cheaper wine, take fewer holidays, postpone replacing the car, etc. One thing is certain: when we cut spending at household level we rarely if ever cut our income. This is not the case at the level of the economy. When the Government cuts spending it cuts its own income: for instance, cutting public sector wages reduces tax/PRSI revenue. But it also cuts other people’s income. This reduces consumer spending, which harms businesses, which in turn can harm employees (wage or hour cuts, even lay-offs); this in turn reduces tax revenue further while driving up unemployment costs. When the Government cuts spending it sets in motion a downward spiral that spreads throughout the economy. We can measure these reductions – approximately. The ESRI ran two simulations in early 2009 showing how (a) a public sector wage cut and (b) a cut in public sector employment would harm the economy but have little effect on public finances. Both simulations were intended to reduce public spending by €1 billion each. Will this reduce borrowing by €2 billion? No. In short, these measures wreak a terrible toll on the economy and economic activity. So what is the effect on the borrowing requirement? Minimal. In the first year, the borrowing requirement will fall by 0.5 of GDP (this year our borrowing requirement is expected to be 11.7 percent). After all this economic carnage, this is not much of a fiscal return. But there’s another important twist to this dismal tale. The impact of these cuts gets worse over the years: consumer spending is cut even further and the downturn in the GDP accelerates. So much for the theory of ‘taking the pain up front’. In fact, the pain gets worse. As a consequence, the ‘savings’ to the Exchequer gets less. By the fourth year the impact on borrowing is reduced – to 0.3 percent. This impact on borrowing is fractional at best. And what will be the effect on the overall debt level? None. By 2014, cutting the public sector payroll will reduce the borrowing requirement by €915 million (not the headline €2 billion cut). However, the negative economic impact will reduce the GDP by over twice that amount - €2 billion. The debt burden doesn’t fall and it may even rise. So let’s summarise: we’ve cut economic growth, cut consumer spending – forcing more enterprises up to the wall, and cut employment; all to reduce borrowing by 0.3 percent and with no effect on the overall debt. I just have one question: who thinks up these proposals? Needless to say, the numbers are on such a knife-edge that, combined with other deflationary cuts, the impact on the borrowing requirement could actually be negative. Perversely, cutting wages and employment could end up worsening the fiscal crisis. When the economy does return to growth, when it starts to climb out of this recessionary hole - it will do so with a giant anchor tied to its ankles. So why is the Government proceeding with such cuts when all the evidence shows that they will have almost no impact on the fiscal deficit or the overall debt burden? It only makes sense when we understand the Government’s real agenda: maintaining the low-tax economy. Only by cutting public sector spending – regardless of the harm to growth, jobs and spending – can they keep tax levels at their historical lows (for discussion of this – see here). Public sector workers are engaged in industrial action to defend their living standards. But now we can add another purpose to their action – an attempt to reverse an irrational economic policy that is doing such harm; to both private and public sector workers, and to business. That is what this battle is about. We can only hope that the women and men in the public sector win. If they do, we all win. With industrial action in the public sector ramping up a couple of notches, it is worth revisiting a couple of issues in relation to pay. A critical issue is the fiscal benefit or otherwise that accrues to the Exchequer from cutting public sector wages – I will examine this in the next post. Here, let’s take a look at another issue – a comparison of public sector labour costs throughout Europe. Quite a claim – especially when there is no data to back this up. One of the problems in comparing public sector wages internationally is that there is no internationally agreed definition of ‘public sector’ employee. For instance, in Ireland are ESB workers ‘public sector’? They’re not private sector as the company is publicly owned. However, they don’t fall into the category of ‘General Government Employee’ nor are they paid out of the Exchequer pay and pension budget. Defining these ‘public enterprise’ workers is one of the complications international agencies face when defining ‘public sector’ or ‘Government employees, especially when different countries have widely varying organisational practices. However, the EU Klems database compiles comprehensive data on total labour costs and total hours worked by various economic sectors. Some of these can be directly related to the public sector - in particular NACE L: Public Administration & Defence. Throughout Europe, including Ireland, it is likely that all employees in this category will be public sector workers (unlike NACE N: Health & Social Work where, in Ireland, only about 55 percent of all employees are in the public sector). So what do we find when we compare labour costs (wages plus employers’ payroll contributions) in the public administration sector which, in Ireland, makes up approximately 100,000 employees? When compared with our peer group in the EU-15 (excluding the poorer Mediterranean countries), Irish labour costs per hour are €4.28 per hour below average – or 14.2 percent. The Sligo Champion might want to revisit their headline. Of course, this is before both the pension levy (which wouldn’t show up as a pay cut in these tables) and the Budget 2010 pay cuts (which would). So there is a reasonable chance that Irish public sector labour costs will have fallen further behind European averages. (I won’t even go into PPPs, factoring in living standards; Irish public sector wages would fall even further behind European averages). This data might be surprising for those who give the headlines the benefit of the doubt. But it shouldn’t be. As has been continuously pointed out, Ireland is a relatively low-waged economy – both private and private. No doubt, the counter-argument will be, ‘Regardless of comparisons, we have to cut public sector wages because of the fiscal crisis we are in’. We will deal with that issue in the next post. But let’s at least start setting the record straight – a record that has been distorted by unsubstantiated assertions... Irish public sector labour costs are not high, the men and women who have been subjected to an average 14 percent pay cut over the last year, are not by comparison expensive to employ. If anything, by European terms, we are getting a good deal. Too bad public sector workers – who offer a considerable amount for relatively low cost – aren’t getting the same deal. With demand for rental accommodation likely to rise in the long-term, we need a sector that can provide life-long living options for single people, families with children, elderly - all the various demographic groups. But the Irish rental sector, long ignored by Governments, is not as currently structured, up to it. How can we transform it? Go have a read. So George Lee has resigned. No doubt this will fill newspaper columns and blog posts with analysis of what this means for Fine Gael, Enda Kenny (will he be pushed?, the Government and, of course, George. So far the one question that has not been answered - and not raised much either - is: what were the policy disagreements that drove George out of Fine Gael and out of the Dail? So far, all we have been treated to is, from George's perspective, is that he didn't have sufficient input into Fine Gael policy. So far, however, he hasn't touched upon the specifics of the type of policies he wanted input on. Did he have proposals that were unacceptable to Fine Gael? Were there Fine Gael policies unacceptable to him? What would have been the result of such input? Or are we in the 'policy-free zone' that constitutes so much of Irish politics? If so, if there were no fundamental differences between Fine Gael policy and George Lee, then what we have here is a case of someone who resigned because he didn't have enough input into policy that he didn't disagree with anyway. Or maybe there's something more provocative. Maybe George had nothing left to say on economic policy. Go back to his 10-point plan. Read all the points he makes. They have, for the most part, already been take up by Fine Gael (some of them, like point number one, was already party policy) or has been acted upon by the Government. His 10-point plan that he ran on in the by-election is pretty much last year. Maybe he just couldn't think up another 10-point plan to impress upon his party, the Government and the nation. Maybe he just lost his . . er . . edge. Yesterday evening I was on Matt Cooper’s The Last Word (5:00 segment) with a representative from IBEC discussing wage levels. I quoted the numbers from the US Bureau of Labor Statistics, Eurostat and Destatis (German Statistical Board) to show that Irish labour costs are not high; indeed, they’re rather low by comparison with our EU partners. The IBEC spokesperson insisted, however, that Irish wage levels are high – 15 percent higher than the EU-15 average. He quoted from the EU Commission’s AMECO database. I had no wish to get into an argument over this database or that; or get into a detailed deconstruction of the AMECO numbers. I just said I would put up the sources on this blog and let people decided for themselves. Below I present the data and links. Then I look at the AMECO database. For it is the only one IBEC spokespersons use – and in doing so they are knowingly misleading the debate over our wage competitiveness. Irish private sector wages are 1 percent below the EU-15 average (including lowly Portugal and Greece) and 14 percent below the average of our peer group – the other top 10 economies. Irish manufacturing wages are 2 percent below the EU-15 average and 16 percent below our peer group’s average. Labour costs for industrial workers (excluding management and clerical) are 3 percent below EU-15 average and 18 percent below our peer group. These two databases are based on the actual cost of labour to employers on any hourly basis. This is the better type of measurement of costs in an economy. OECD Benefit and Wages: this database, which measures private sector wages (NACE C – K) has a number of defects. First, it is not a measurement of labour costs but rather an attempt to identify annual wages. However, it acknowledges that some of the countries data may not include managerial and supervisorial wages, therefore under-stating some numbers. It also acknowledges that some countries data do not separate full-time and part-time wages (which we will see below can distort numbers). In 2007, the OECD shows Irish wages barely changing – up less than €300. In fact, in some previous editions of the 2007 database, average Irish production worker wages were much lower, below €33,000 – which is consistent with CSO data. With these caveats, the database shows that average annual private sector wages in Ireland are 12 percent above the EU-15 average but 2 percent below our peer group average. However, given the statistical inconsistency and methodological shortcomings, one should be extremely cautious about citing these numbers. EU Commission AMECO: this database measures income but not hourly labour costs. Rather, take an ‘aggregate GDP’ approach. Essentially, they take the total amount of wages, salaries, bonuses, social security contributions and divide them by the number of workers. There are two problems with this. First, it does not distinguish between full-time and part-time for most countries. Ireland has one of the lowest proportions of part-time workers. This can skewer the wage data (Germany, for instance has nearly twice as many part-time workers as a proportion of their workforce as Ireland). Let’s say that an employer needs 1000 hours worked with a total wage bill of €20,000. If that is divided up among 50 part-time workers, they will 20 hours a week with an average pay of €400. However, if that work is divided up among full-time workers, the average pay will be €800 per week. Whatever about the pay of different workers, there is no cost difference to the employer and no difference to wage competiveness. Second, it does not distinguish between hours worked. Ireland has one of the highest levels of hours worked in the EU-15 (two more working weeks per year than the EU average). If an employer needs 1000 hours worked with a total wage bill of €20,000 and divides it up among workers on a 40 hour working week, there will be 25 workers earning €800 per week. However, if that same employer divides up the working time on 35 hour working week, there will be 28.5 workers earning €700 per week. So, while there is a difference in wage, there is no difference in cost to the employer and no difference to wage competitiveness. An aggregate approach rarely makes these distinctions. It can sometimes use a ‘full-time equivalent’ measurement – but AMECO acknowledges it cannot do this for all countries. This is IBEC’s database of choice. As the IBEC spokesperson on the Last Word said – Irish wages would appear to be 15 percent higher than the EU-15 average. And this is what the AMECO database produces. But does this figure measure hourly labour costs? No. Does it measure wage per hour worked? No. Does it measure the total amount of wages in the economy per total working hours? No. This database tells us what it tells us – and it tells us very little in terms of labour cost competitiveness. If the data compensated for hours worked and part-time employment, the figure would approximate the data from Destatis, Eurostat and the US Bureau of Labor Statistics. Forfas’s report on the retail sector showed that average Irish wages are low in comparison with the Dutch retail sector. This is more than just an argument over numbers and methodology. This is about identifying what exactly is wrong with the Irish economy and, from that, constructing policies to address the defects. But IBEC is not interested in that. It is intentionally distorting the debate in accordance with its own agenda. Their use of wage statistics is deliberately misrepresentative. Very simply, IBEC should stop it. The Government has a plan. And, yes, you should be worried. The Government’s approach to fiscal stabilisation – namely, a deflationary approach – is often portrayed as ‘the only option’. Of course, it isn’t. There are other approaches, in particular those based on boosting investment and output in order to grow employment and, so, the economy out of the fiscal crisis. We’ve debated those alternative approaches on this blog at some length. But there has been no national debate. Why should that be? In short, it’s not because the Government has examined, modelled and analysed all the alternative approaches – they haven’t (if they have, it has been as secretive as the D-Day planning process). It’s because the strategy they are pursuing is more about using the fiscal deficit issue as a pretext to pursue a wider agenda: to maintain the low-tax, low-spend model. That Ireland is such a low tax, low spend economy is without doubt. In 2006, when the average Euro zone spend was 47 percent of GDP, Ireland trailed badly at less than 40 percent (of GNP). Of course, many will point out that we don’t have a big defence budget (neither do most EU countries by the way), that we have a young population and, therefore, don’t need as much social spending, etc. But there are counter-points: our young population requires extra education spending – which we don’t do; our high levels of relative poverty require extra social protection spending – which we don’t do. Our physical and social infrastructure is sub-par and requires additional ‘catch-up’ spending. We can go all day on the swings and roundabouts on this – but in the end, we have a low-tax, low-spend economy. And that’s exactly where we will end up in 2014 if the Government gets its way. In 2006, our net current expenditure (excluding social insurance and interest payments) was 18.6 percent of GDP. This measurement is useful because it is the amount of money we spent on public services, public sector wages, means-tested and universal social welfare schemes, including Child Benefit, etc. In 2010 it is estimated that this will rise to 25 percent but the primary reason for this rise is social welfare (non-social insurance) and falling GDP levels. However, by 2014 the Government intends to cut this back to 19.4 percent. This is pretty grim. We are falling back to approximately 2006 levels even though we will be carrying a much higher level of unemployment. And its not as if 2006 was some golden age of public services. We fell well behind EU norms: no free primary health care, no early childhood education and a creaky primary care system, low levels of social protection, etc., etc. etc.). We would have had to increase spending on general public services by more than 60 percent just to reach the EU-14 average. And this was during the salad days. Just to be clear, between 2010 and 2014 the Government intends to cut net current expenditure (excluding interest payments) by -9 percent in real terms. Anyone expecting improved public services or social protection will be disappointed. But there’s one more little twist in this cutting tale. These numbers do not take account of the impending €6.5 billion in annual adjustments that the Government will pursue over the next four years (in the previous post I showed how another large portion of ‘fiscal adjustment’ has been hidden in the current expenditure figures). Therefore, these numbers will only hold if all the adjustment comes through tax increases. More likely, however, is that some of the adjustment will come through additional, unstated public spending cuts. If only a quarter of the adjustment comes via current spending cuts, then the Government will be cutting current spending by over -12 percent in real terms. It’s the same story for capital investment which the Government intends to cut by over 20 percent in real terms. This is, again, before anything more that might be taken away through further fiscal adjustments. This bottom line of real cuts will further deflate the economy at the very moment it is trying to grow. On the flip side – taxation – we again see Ireland down the league tables. In 2006, Irish general government revenue was 11th highest out 16 Euro zone countries (with the poorer countries ranking behind us – Greece, Slovakia, Cyprus, Malta, etc.). In that year, tax revenue (excluding social insurance contributions) made up 25.7 percent of GDP – and that was in the year of boom property-related tax revenue. What can we expect in future years? By 2014 tax revenue will be 19 percent of GDP – well below the level in 2006 when we were still a relatively low-taxed regime. Of course, this doesn’t include the fiscal adjustment of €6.5 billion. If the Government decided to pursue all that adjustment through increased taxes, the tax revenue/GDP ratio would still be below the 2006 level – 22.5 percent. However, if only 75 percent of the adjustment comes through tax increases, that ratio will fall to 21.7 percent, even further below the 2006 level. So that’s the game plan – maintain the low-tax, low-spend model that has dominated economic thinking. Keep spending on public services, social protection and capital investment low. Keep tax levels low. Keep the public realm low. And if you’re looking for better services or more investment to generate growth and jobs – you’ll have to look in other places. Don’t look here. But most of all, don’t be disappointed. Because the Government has been quite honest in all this. Sometimes numbers tell the best story. They may not tell us why – that comes afterwards, when we try to explain. But numbers are a good starting point. The OECD Economic Outlook has produced a set of numbers with which we can do some charting (I apologise but the Outlook is not accessible on-line -at least, I can't find it; if readers want the full copy please e-mail me I will forward them on). And a dismal set of numbers this is. Much of these are estimates and so the numbers will change. But the general trend is pretty much set. Let's start with real GDP growth. For the period 2008-2010, Ireland is a league leader in the recessionary stakes -– by far. The next worst-suffering country – Finland – will only see their economy fall by less than half the Irish rate of decline. The average decline in the other EU-15 countries is estimated to be less than -3 percent; Ireland, over -12 percent. Told you it was dismal. And 2011? Now here we are really getting into tentative territory – especially with the OECD warning that the global recovery is still too ‘thin’ and the IMF advising countries not to prematurely exit from stimulus measures. So treat these projections carefully. Still, they tell an unsurprisingly similar story. Irish GDP will grow by 1 percent while the other EU-15 countries will on average grow by 2 percent with Eurozone countries growing by 1.7 percent. Ireland will remain the worst performer, apart from Spain. So we have a situation where the Irish economy was hit hardest during the recession and will lag behind other EU countries coming out. It should be noted that OECD estimates are at odds with most domestic commentators who are predicting higher growth for Ireland in 2011 (with the exception of Jonathan Stenning of Cambridge Econometrics whose numbers tally with the OECD). So, it remains to be seen who will come out right. We should all hope it’s not the OECD. But you don’t get off that easily. Here are some more numbers to really make your day. In regards unemployment, there we are again – at the top. Our rise in unemployment has been twice the pace as other EU countries. Italy will have suffered least while Spain is the next in line in the dismal stakes. In fact, of the other 14 EU countries, nine will see their unemployment rates rise by less 3% points. And let’s not forget – most other countries don’t have the safety valve of emigration. If we turn to the EU Commission database (the OECD doesn’t have this breakdown) find that Irish employment will fall by -11.7 percent between 2008 and 2011, compared to the Eurozone average fall of -3 percent. We are shedding jobs at nearly four times the rate of the Eurozone. We can go through other numbers. Take investment: In Ireland, it will fall by over --70 percent (yes, -70 percent) in the three years to 2010. Compare that to the Eurozone average fall of -12 percent. In 2011, Eurozone investment will rise by 2.3 percent. Ireland will be lagging with a growth rate of 0.5 percent. Of course, some will point out that this reflects the bursting of our property bubble and, given our over-reliance on construction, this decline shouldn’t be surprising. Well, yes, that’s the point about investment during the last decade. But let’s look at non-housing investment (and here we have to turn to the EU Commission database since the OECD doesn’t have this breakdown). Investment in equipment will fall by over 50 percent in Ireland, whereas the decline in the Eurozone will be less than 18 percent. Or consumer spending: in Ireland, consumer spending will fall by over -10 percent in the three years while the Eurozone average will be less than -1 percent. And in 2011, while Eurozone consumer spending will rise by 1.1 percent, Ireland will remain in the doldrums with spending still falling at -1.4 percent. And domestic demand? This is the total amount of purchases in the economy – consumer and business, which reflects a broader level of economic activity. Well, it tells the same grim story. Given all this – all this decline, all this collapse – is it any wonder that by 2011 the OECD is predicting that the Irish government deficit will be -11.2 percent while the Eurozone average will be almost half that, at -6.2 percent? There are some commentators obsessing over public expenditure levels and whether we should cut child benefit or hammer, again, public sector wages (how many times are we going to that well). But they miss, not only the elephant in the room, but the herd of elephants – the dramatic, almost unprecedented collapse in economic activity. These are truly dismal numbers. I’m sure that people will have different reasons for how we arrived at this dismal state of affairs and how we might get ourselves out of this. Good. We need that debate. We need it now. All we are getting now is a one-hand-clapping debate where we are bombarded by demands to cut, cut, cut – cuts that have actively contributed to falling growth, employment, investment and consumer spending. But, hey, let’s end on a positive note. Besides all this, besides all those dismal numbers from the OECD report, everything is just fine. Ireland is in the World Cup, it hasn’t been raining in the last week, and Jedward are, in fact, anti-bourgeois avant-garde artists, inspired by the Dada experience that swept European culture early last century. Oh, and, yes, the Government’s policy is working. One could despair. All the major political parties are supporting another round of fiscal contraction, though they may differ on the balance of tax increases and public spending cuts. In this respect, Fianna Fail has won that particular battle, we are just fighting within the parameters they have set. There is seemingly no challenge to the deflationary orthodoxy on the horizon. Except . . . .
Sinn Fein has published its 2009 pre-budget submission, ‘The Road to Recovery’. In short, it poses a more sophisticated approach to our economic and fiscal crisis. On the one hand, an investment stimulus to generate growth; on the other hand, a range of mostly taxation measures to start to repair the public finances. Sinn Fein proposes to use different instruments to attack the distinct parts of the deficit – the cyclical and the structural. These would be supplemented by a range of fiscal stimulus – reducing alcohol duty over the Christmas period, reintroducing the Christmas bonus, and a ‘cost of living’ package that would reduce everyday expenditure items (utilities, public transport, insurance policies, etc.). There’s a lot of material here that would need to be developed. For instance, I’m not sure what modernising CE schemes would look like – especially with a National Development Scheme running alongside it. The Front Line services initiative looks extremely worthwhile – so much so, why make it temporary? This has the potential of substantially increasing public sector productivity. And Sinn Fein might have benefited from examining the ICTU/Fine Gael proposals for promoting public enterprises as an engine of infrastructural investment to raise long-term productivity (next generation broadband, green technology, etc.). Taxation: a new third tax rate of 48 percent for those over €100,000, a wealth tax (or, as I like to describe – a comprehensive property tax), standard-rating tax reliefs while getting rid of property-related ones along with the private hospital co-location relief, abolish the PRSI contribution ceiling, increase the tax on ‘second homes’ along with other capital income measures, etc. Spending Cuts: apart from a couple of innovative suggestions such as establishing a state wholesale distribution of drugs and the wider use of generic drugs (on top of saving money, it could actually be little money-spinner), this section mostly focuses on public sector pay and salary reductions, including politicians and professional fees. There’s no sense in going over each detail. We can always find something to disagree with. For instance, I wouldn’t support capping public sector pay at €100,000; this would disadvantage the public sector in the specialist labour market and, in any event, as CSO researchers have shown, higher paid public servants suffer a wage disadvantage, especially males, compared to their private sector counterparts. And I would prioritise the effective over the marginal tax rate. But in the main, the proposals go in a positive direction. Sinn Fein proposes to pay for their stimulus programme by: (a) taking a proportion of the revenue raised from their tax/spending measures (about €1.9 billion), and (b) dipping into the National Pension Reserve Fund (€2 billion). ‘ . . . we should not be afraid to sustain some level of deficit financing – borrowing for infrastructural development – something which most other countries use as a matter of routine . . . The claims that we are over-borrowed, that we cannot sustain the current level of borrowing and that public spending is the cause of all fiscal ails, are untrue . . . ‘. Nonetheless, to the extent that resources for stimulus can be obtained from low-deflation tax resources and public spending efficiencies, that is clearly an advantage. The argument for debt-financed stimulus has never rested on ‘we borrow because we can’, but rather, ‘we borrow because we must’. Stimulus that is partly financed from own-resources is preferable. But let's take a step back for a moment. Because there is something more going on here than just a new calculation, a catalogue of different policies. Franklin Roosevelt once said, ‘There are many ways to go forward, there is only one way to stand still.’ At present, the current economic debate is standing still, stuck on this contraction. There is no dialogue, no conversation – merely a hectoring, a lecturing: how we must fact reality, how we must take the pain up-front, how hard decisions must be taken. Sinn Fein is pointing to a new dialogue, one consistent with going forward; where more and more people are encouraged to present all sorts of ideas to grow the economy – from business supports to social protection measures, from state spending to incentivising private investment, from increasing taxes on some to decreasing taxes on others. Now compare that to today, when every idea, every suggestion no matter how worthwhile is met with a ‘We’re broke, can’t do it, where’s the money coming from.’ My favourite is ‘We must cut our living standards to improve our living standards.’ That would depress any economy regardless of its potential. Sinn Fein has provided, not only a clear and coherent alternative to the deflationary orthodoxy, a more sophisticated fiscal platform from which to launch recovery. They have demonstrated a new way of how we can talk about our economy. The discussion on Frontline last night at some points bordered on the surreal. Take the discussion on taxation. The question was posed – how high would tax have to rise in order to generate €4 billion tax revenue (as opposed to cutting €4 billion). The first thing that struck me was – why was this discussion taking place? Is there anyone in the current debate who has called for an increase of €4 billion in taxes in the upcoming budget? If there is, I must have missed that meeting. It could be an interesting hypothetical laboratory question – much can be learned by such exercises. But I would have thought that Frontline was more interested in discussing the specific issues in the current economic and fiscal crisis. Essentially, panellists were asked to find an answer to a question that no one has asked. Oh, my. A top rate of tax of 75%. And on a married couple (who are likely to have children). And at the current thresholds we have today. Well, you won’t find many people relishing that prospect. And that’s the point. These are scare stories, nothing more; frightening the children at bedtime to ensure they dream of public spending cuts. ‘Mr Lenihan said the marginal rate of tax is 53 per cent and that if the Government was to increase it further to raise an extra €1 billion “everyone or every couple earning over €100,000 would pay tax at a marginal rate of 63 per cent’. The marginal rate of tax refers to the amount of tax you pay on every extra Euro you earn. For instance, if you’re on the higher rate of tax, combined with the levies, you’re marginal rate of tax rate is 53 percent. For every extra Euro you earn, you pay 53 cents in tax. The effective rate of tax refers to the amount of tax you pay as a percentage of your income. Many commentators want you to ignore the latter and concentrate on the former. That’s because the former, the marginal tax rate sounds, well, more frightening. But it doesn’t tell the true story. Minister Lenihan embarrasses himself when he trots out numbers like these because it is clear he hasn’t even read the reports his own Department produces. The Department produced a survey – a sampling of 439 high earners – and assessed how much actual tax they paid as a percentage of their income (the effective tax rate). The results make for some sobering reading. In 2007, the marginal tax rate would have been 43.5 percent. But that figure is a long ways away from the reality of those who pay less than five percent of their income on income tax. Or 10 percent. Or 15 percent. How does this happen? The survey publishes a list of tax breaks that primarily only high earners can access – about 54 of them. These reliefs, allowances, exemptions all reduce the tax liability for those on high income. Now compare that to the chart above. Minister Lenihan and many commentators don’t want you to see any of this. And, indeed, it is hard to see. The level of secrecy and opaqueness in the tax system is part and parcel of Ireland’s world class standing as one of the most secretive tax havens (take a look at this – personally, if I have to live in a tax haven, sipping Pina Coladas and frying prawns on a beach in Bermuda seems preferable). How can this be addressed? We already have a structure in place. For the super earners – those on €500,000 or more – they can avail of tax breaks until the cows give beer. But no matter how many they avail of, they must pay a minimum effective tax rate of 20 percent. So why not increase this small amount and lower the thresholds. Is it too much to ask that those who earn €100,000 per year pay an effective tax rate of 25 percent? For those on €200,000, 30 percent? For those on €500,000, 35 percent? This wouldn’t raise a pot of gold. But it wouldn’t be a pot of nothing. And the great thing is – you wouldn’t have to raise the marginal tax rate one cent. The really frightening thing is the way that Ministers and commentators work so hard to conceal these basic facts from the national debate. But that doesn’t mean we have to follow suit. A little night-light will keep those scary monsters at bay - even Government Ministers. IBEC’s recent quarterly review should give us pause. They are one of the few groups who attempt to project economic growth up to 2013 – and the numbers are not inspiring. They suggest that Government projections are wholly optimistic and that, on current trends, the 2013 target date to bring our public finances into order will be missed. Indeed, they suggest that the current fiscal policy will continue to land us with ever higher debt levels. Of course, these are only projections and should be treated as such. They may seem reasonable now but, well, events. Still, it’s a useful exercise because too much commentary takes a static, detached view of public finances. Progressives, however, argue (or should argue) for a more dynamic relationship between the wider economy and budgets. So let’s run these IBEC numbers and see what comes out. IBEC is not as pessimistic as the Government in the short-term (this is consistent with other commentators' caution optimism for next year). However, coming off the trough, IBEC suggests that growth will be much moderate than the Government is projecting. In nominal terms, this could mean a GDP level some €15 billion lower than the Government is projecting for 2013. What’s more worrying is the economy’s ability to generate employment and investment. On the jobs front, IBEC suggests that employment will remain sluggish and won’t return to peak levels until 2015. On the investment front, IBEC’s projections are considerably below that of the Government. In fact, they project investment to keep falling in 2011 and warn that the economy could still be negative if other sectors don’t pick up sufficiently. So what’s all this mean for public finances? Taxation can’t defy the laws of economic gravity. If growth is negative or marginal, there is a limit to how high it can go. Between 2009 and 2013, the Government projects taxation to rise from 20.6 percent of GDP in 2009 to 22.3 percent in 2013. That’s on foot of, at that time, planned increases in taxation which, for next year, have been largely ditched. Let’s keep the Government’s tax revenue ratio and plug it into IBEC projected growth. If public expenditure stays the same, what would the deficit look like? IBEC projects that unemployment will be slightly lower than what the Government expects by 2013 – by about 1%. This should ease pressure on expenditure, though this may depend on the numbers choosing to emigrate as opposed to staying here on the dole. A real problem, though, is that the above uses the Government’s April ratio of tax revenue to GDP. It will be lower – in 2009 to 2010. The Government is ready to concede that tax revenue will only bring in €31 billion this year, a ratio of 19 percent, not 20% as under their April projection (and which the above table uses). If this is a portent of sluggish tax revenue in future years – the deficit could be widened even further. Well, there’s that, but then you depress growth further and end up in a similar situation. That’s the deficit-trap that the orthodoxy has landed us in. The key thing here, therefore, is growth. If you grow the economy, then a lot of pieces start falling into place; not all of them, but enough to spring ourselves out of the deficit-trap and on to growth path. To rework that well-worn phrase: it’s the economic growth, stupid. (a) You have a recession when an economy’s GDP is negative for two consecutive two quarters (six months). This is a very narrow definition and others would include unemployment, consumer spending, income, industrial production, etc. But let’s run with the narrow definition. (b) A depression, however (and remember, this is a rule-of-thumb) is when an economy falls by either 10% or for three years or longer. The Irish economy certainly is in a recession and, by the rule-of-thumb definition, we’re in a depression. The economy will fall by more than 10% from peak to trough. However, it is understandable that we don’t use the word ‘depression’ – as that word conjures up scenes of mass deprivation and extreme poverty in a time before a modern welfare state. The issue of when the economy returns to quarterly growth will be more than just a statistical fact – it will be highly politicised. Optimistic forecasters predict the economy – on a quarter-by-quarter basis – will go into the black as early as the first quarter of next year. Others suggest it will occur later. Whoever is right, we will probably see GNP increase on quarter-by-quarter basis sometime next year. No doubt the Government will make great play of this – pointing out that their ‘policies’ have worked, how they have stabilised the situation, the clouds dissipating and we can all look forward to blue skies. [I love that phrase – stabilised; at dinner a man and woman discuss the fact they have lost their jobs; but then the man pipes up: ‘Well, at least the situation has stabilised’. Yes, of course – they have no more jobs to lose]. However, this is where Terry’s point becomes relevant. Let’s examine the US depression experience. In 1933 the depression had troughed – after losing nearly half of its GDP in nominal terms. With the New Deal activist polices, the GDP started rising, continuing up to 1937 (in 1938 the economy took a dip following a premature budgetary contraction – what has been called a recession within a depression; Irish budget fundamentalists, take note). The point here is that American economy started growing in 1934: GDP, consumer spending, private investment, exports – all boosted by a massive increase in state expenditure. But no one says that the US’s Depression ended in 1934 even though the economy was in growth. GDP, while growing, remained well below 1929 levels. It wouldn’t exceed those levels until the eve of war – so calamitous was the decline during the years of Hoover’s fiscal conservatism. That’s why we say the Great Depression lasted for years – even though for most of that period the economy was in growth. However, if nominal GNP growth after next year is consistent with the Government’s April projections – then we will not return to 2007 levels until 2014 at the earliest; if growth is below those projections, then it won’t be until 2015. So, sometime next year, when the quarterly economic numbers come out positive, when both GDP and GNP growth don’t have a minus sign in front of the numbers – just remember, this represents a bounce from the trough; that’s all. No way will it constitute an ‘end to the recession’, no matter how much the Government Ministers and their allies among commentators may spin it. The Irish recession has a lot of legs and a lot of ground to run on. Sometimes, something happens that takes your breath away. The chain store Boots is engaged in a deplorable assault on their employees’ wages and working conditions – employees who are some of the lowest paid in the economy. Not only that, it constitutes an assault upon other enterprises, the Exchequer and the Irish economy. Unsurprisingly, the negotiations didn’t go too well, especially given that Boots is a profitable enterprise. Mandate requested the company attend the Labour Relations Commission (LRC) to sort matters out. Suddenly, in August, Boots management wrote to the union stating that unless Mandate accepted the new pay and working conditions, Boots would terminate all existing collective agreements negotiated with the union over the past fifteen years. In addition, the management stated they would not attend the LRC. This action certainly wasn’t intended to build an atmosphere for constructive dialogue. Eventually, management relented and attended the LRC with Mandate in October. However, such was their attitude, they might as well not. All they were prepared to do was remove the threat to the collective agreements if the union unconditionally accepted the new conditions of employment in full. Currently, Mandate is balloting Boots employees for industrial action. The ballots will be counted on November 6th – ICTU’s National Day of Action. It doesn’t get much worse than this. A full-time 39-hour per week employee at the top of the scale earns €28,800 – about 30 percent below the average industrial wage. Boots management is demanding a pay cut of nearly €4,500 a year. That’s savage. But Boots management isn’t just targeting those at the top of the scale – they’re demanding 25 percent cuts in holiday and Sunday pay for all employees. This isn’t a company in trouble. In 2008, the Irish division in Boots earned €20 million in 2008 with current cash reserves in excess of €70 million. Worldwide, Alliance Boots posted an EBITDA of over £1 billion in March this year (that’s trading profit before depreciation and amortisation) while their underlying profit – excluding finance costs – is a healthy £236 million. Okay, but what now? How has the recession and the decline in consumer spending affected Boots? Probably not much. The CSO’s Retail Sales Index shows all businesses suffering a drop of 7.5 percent in sales (from a 2005 base year). But sales in the Pharmaceuticals & Cosmetic Articles group have actually increased by 17.1 percent – the biggest increase of any retail grouping. That doesn’t’ necessarily mean that Boots turnover or profits have increased by that amount. But since it is a major player in this grouping, we shouldn’t be too surprised to see them staying relatively dry in this recessionary storm. The treatment of employees is bad enough – it rightly offends most people’s sense of justice and fair play. The issues, however, spill out of the workplace and into the larger economy. For instance, Boots is not just attacking its workforce – its attacking the Exchequer. A full-time employee on the top of the scale is paying a little over €4,700 in income tax, PRSI and levies. In addition, employers’ pay a little over €2,900 in PRSI. The total benefit to the Exchequer is about €7,650. If, however, Boots succeeds in cutting wages at the top of the scale, the benefit to the Exchequer falls by over €2,700. Even including the potential increase in corporate tax revenue (if Boots pays at the nominal 12.5 percent; it should be pointed out the real effective tax rate, when allowances and reliefs are included, is less), the net loss to the Exchequer would be over €2,100 for each Boots worker in this category. Now calculate the tax loss (and this doesn't count lost VAT revenue from reduced spending) from the full range of pay cuts that are being demanded from the 900+ employees in the chain. The owners of Boots gets the gain; the workers – both in Boots and throughout the economy – take the pain. And it doesn’t stop there. Staying with the full time Boots worker at the top of the pay scale, her/his disposable income would fall by nearly €40 per week. If we accept that most of this money would have been spent (those on low and average incomes have a higher propensity to spend, unlike those on higher incomes who have a higher propensity to save), then that’s money not flowing to the proverbial local shops. Businesses reliant upon selling goods and services into the domestic economy will suffer a loss of turnover. Many of these businesses are genuinely in trouble. This decline in sales will hit them even harder with all the consequences this may hold: lower profits tax, reduced wages and/or hours, job losses: this is the deflationary process set in train by Boots. It’s not just their own workers who get slammed, it’s not just the Exchequer that gets hit – other businesses, their owners and workers, also suffer. That’s why the looming battle at Boots is not just a fight that only concerns those who work there. It’s our battle as well. It’s not just about ‘an injury to one is an injury to all’. This is a battle over public finances, this is a battle over economic growth, this is a battle over all our living standards. That’s why, if the employees at Boots vote to take industrial action, they deserve our fullest support. If you want to help create public support for the Boots workers – and hopefully force management to step back from their damaging course of action before it comes to industrial action – please spread the word. Such is the success of the National Treasury Management Agency, it has created a new economic and fiscal pitch for us – one that progressives should now seriously consider playing on. I won’t go over the tedious and ill-founded arguments – that Ireland’s fiscal plight is such that the international markets won’t continue lending to us. I don’t have to. The NTMA has settled that argument, if not once and for all, then certainly for the foreseeable future. First, they received €14 billion in bids. This showed considerable interest market appetite for Government debt. In fact, this was the largest bid for any bond in the Eurozone this year. Second, over 90 percent of the investors were foreign – so this wasn’t a case of domestic banks returning the Government a favour. Third, no one can question (at least in the international markets) Ireland’s ability to repay its debt. If there was any doubt, no one would invest in a 15-year bond. So on the specific issue of Ireland’s ‘capacity to borrow’, which is different from the issue of how much we should borrow, there is no question: we have that capacity. Everytime the NTMA throws its net into the bond pond, it pulls out a lot of fish. So what does this mean in fiscal terms going forward? It changes the situation substantially. Such is the scale of the NTMA’s pre-borrowing (borrowing, not for current, but for future needs) that by year’s end, they will have around €30 billion in ‘free cash balances’ – that is, the Irish Government will have access to €30 billion already borrowed. In these three years, nearly €15 billion would be drawn down – reducing the NTMA’s cash balance of €20 billion in 2010 to approximately €8 billion by 2013 (this would involve some topping up of the cash balance during those three years). This, of course, was based on April projections. Already, under Fianna Fail’s woeful fiscal mismanagement, this has gone awry. Instead of annual deficits of 10.75 percent this year and next, we are looking at deficit of 13 percent for both years – with the risk for next year being on the downside. Therefore, we may need that extra padding the NTMA has provided. However, let’s just keep to the April projections for illustrative purposes. Now, instead of having a cash balance of 12 percent of GDP, we have a cash balance of over 18 percent. If the drawdown schedule remains the same as above, by 2013 we’d still have a cash balance of 10 percent (not as the current strategy has it– at 4 percent). In other words we’d have €10 billion more than planned for. This is the new €10 billion pitch for us to play on. This is the pitch from which a new fiscal policy could be launched – a policy that seeks to drive growth, not deflation; that seeks to invest in the economy to grow it, not depress it. This fiscal policy, in turn, would drive up tax revenue (through increased employment, aggregate wages, consumption, and investment) and, as a consequence, reduce demand on social welfare payments and social services – thus driving down the deficit. And all this would be financed – not by deflationary spending cuts or new borrowing; it would be financed by money we have already borrowed. We’d be putting that additional cash that the NTMA has sourced to work. It’s too early to say how much of that €10 billion we could prudently access – much will depend on the Government’s new projections in the upcoming budget (will they continue to hold to the 2013 target date for Maastricht compliance? Will they accept reality and adopt David Begg’s suggestion?). But the NTMA has given us considerable fiscal flexibility. It would be a shame to squander that opportunity by continuing failed fiscal policies. The NTMA has built a new pitch for us to play on. Let’s put on our jerseys and go have fun. As we are all frog-marched down to the Finance Minister’s picnic, let’s see what effect cutting Child Benefit will have. For all the indications are that this payment is in the firing line. Many have argued that it’s a no-brainer – sure, doesn’t Child Benefit get paid to rich folk? Doesn’t that mean it’s regressive? We could cut the payment without harming (too much) low and average income groups – and save the state a lot of money. Cuts in Child Benefit rates will impact much more severely on low/middle income groups, resulting in a rise of 17 percent in child poverty. This would reduce expenditure by between €400 and €450 million. Taxing Child Benefit will impact less on low income groups (though its effect on middle income groups will be the same) with only a small rise in child poverty of 3 percent. This would reduce expenditure by €370 million. If one had to choose between the two – you’d pick the tax route: less regressive, less impact on child poverty, and approximately similar levels of reduced government expenditure. Even so, there are issues. While cutting Child Benefit would be woefully regressive, the effect on middle incomes – the 2nd and 3rd quintiles - will still be slightly more regressive than those on higher incomes. It’s a matter of the least worst solution. Bear in mind, the ESRI doesn’t model these proposals to assess the actual net savings that would be gained nor the impact on the economy. The net savings would be less, of course – arising out of reduced spending taxes, the knock-on effects of reduced consumption and a slight downward revision of the GNP. Therefore, the savings would not equal the reduction in expenditure. However, there are two fruthe important considerations that should be factored in before passing judgement on the issue of taxing Child Beneft. This not a criticism of the ESRI researchers – their findings advance our understanding. But let’s advance that even more – by using the CSO’s Household Budget Survey. This cannot be neatly integrated into the ESRI’s model – so it should only be treated as indicative. And the latest data comes from 2005. But it indicates that the impact on low and middle incomes will be much greater than merely measuring the effect on disposable income. Over the next few days there will be considerable analysis of the ESRI’s current quarterly review. I’d like to highlight just one projection – the rising annual deficit. There are two things to remember: the one and only goal of Government fiscal strategy has been to contain the deficit. They have set no targets for job creation / retention, investment, consumer spending or even a timeline on shortening and lessening the impact of the recessionary dive. The exclusive objective of fiscal policy has been to contain the deficit. In keeping with this strategy, the Government brought in the supplementary April budget out of fear that the deficit would rise to -12.75 percent. Only weeks earlier they had published the Addendum where they had set a 2009 deficit target of -9.5 percent (this itself was a downward revision of a target they had set, yet again, only weeks previously in the October Budget – a target of -6.5 percent). The April budget’s measures, combined with the earlier pension levy, was intended to contain the annual deficit at 10.75 percent for this year and next year – winding down to the Maastricht threshold of -3 percent by 2013. So what is the ESRI projecting for this year and next? In 2009, they project the annual deficit to be -12.9 percent. That is considerably above the Government’s target for this year. In 2010, the deficit will remain pretty much the same, -12.8 percent. While we may debate the benefits of varying fiscal approaches there is one thing that stands out: the Government has failed to achieve the one and only target it has set for itself. It has failed – by a wide margin – to control the deficit. Simply put, its fiscal strategy is not working. If anything, it's getting worse. In April of this year, the ESRI projected the annual deficit for 2010 to be -11.5 percent. In July, their projection was pretty much the same: -11.4 percent. Today's release shows a considerable deterioration at -12.8 percent. The ESRI calls this 'stabilisation'. I can think of other words. This has significant implications going forward. Government strategy has been to hold the deficit this year and next at 10.75 percent. Over the following three years they intended to reduce this deficit to -3 percent – closing the deficit by 7.75 percent. This was always going to be a big ask. However, if the Government persists with their failed strategy, they will be starting from a worse position. If the ESRI projection holds, the Government will have a -9.8 percent gap to close in three years. With the deficit going in the wrong direction – what chances of reaching the Maastricht guideline by 2013? ICTU’s David Begg received a lot of criticism for suggesting the target date for Maastricht compliance be postponed a few years. Whatever about the desirability of this proposal (and I believe it is highly desirable), the fact is this is going to happen anyway on current trends. To attack someone for espousing a common sense position shows the extent of denial that is at work in Government circles and among certain commentators. Perversely, though they won’t admit this, the ESRI vindicates the progressive critique of the Government’s fiscal policy. The ESRI supports the continuation of further fiscal correction. In their projections they have factored in a €4 billion correction – made up of tax increases combined with current and capital expenditure cuts (they acknowledge that now the burden will fall more on spending cuts). What is the result of this €4 billion cut in spending and people’s disposable incomes? In 2010, the annual deficit will be reduced by 0.1 percent, or nominally by €550 million. €4 billion in cuts to achieve a reduction of €550 million only proves the old adage: pursuing deflationary policies in a recession is like running in quicksand – you use up a lot of energy, you tire yourself out, but you still keep sinking. In essence, they admit that the fiscal correction planned by the Government will be deflationary. More importantly, it will lengthen and deepen the recession. If these cuts didn’t proceed, the recession would not only end much earlier – but the economy would be in overall growth for the year 2010 (if the correction go ahead, GDP will fall by -1.1 percent and GNP by -1.7 percent next year). To get around this, the ESRI takes up a ‘straw-person’ argument. They pose only one alternative to their preferred deflationary strategy – a revenue-neutral budget; that is, a budget that doesn’t take out any money from the economy. However, no one realistically believes that any Government should sit on its fiscal hands and let the recessionary fires burn themselves out. Too many other things in the economy would be burned down as well. The alternative, as outlined at the recent TASC conference, is to pursue an expansionary fiscal policy based on crucial investment in our economic base – investment that we would have to make in any event if we want to improve our competitiveness and productivity going forward. The ESRI doesn’t refer to this alternative, never mind model it. Whatever (though I would have thought that one of the most important roles an institute can do is provide a range of alternatives with an accompanying fiscal and economic assessment). We are, therefore, only left with one course – a deflationary course. And as the ESRI report shows – it is a failed course. Some arguments I just don’t get. For instance, if I were an owner or manager of an enterprise that sold goods and services into the domestic economy (that’s most enterprises) I would be concerned at falling consumption. After all, if people cut their spending, my sales fall. If people are worried about holding on to their jobs, my sales fall. If people’s wages or hours are cut, my sales fall. And if people are made redundant, my sales really fall. The best thing for my business would be to see more money in people’s pockets, more people at work, more confidence in the economy. Therefore, the last thing I’d like to see is some of ISME’s proposals being implemented; namely cutting social welfare, cutting public sector wages (at least those on low and average incomes who make up the bulk of my customers and the bulk of the public sector payroll) or see any worker – public or private sector – lose their jobs. All these would represent a real blow to consumer spending and consumer confidence. But ISME seems to be acting less like a representative of the interests of their members and more like a PR machine on behalf of certain neo-liberal nostrums. They seem intent on pursuing policies that would directly impact on their members – and not in a good way. Just yesterday, ISME’s Mark Fielding was on the New at One, having a go at David Begg’s recent call for a new fiscal policy. Fair enough – how else would you know it’s an ISME representative if they’re not attacking trade unionists? Interviewer: What is your reaction to the trade unions’ declaration that the sky is blue? ISME Representative: This is just one more example of trade union bullying and intimidation. They threaten to paralyse the economy. Now they're making demands on the sky. The Government must ignore them. Okay, tongue in cheek but the following real exchange wasn’t that much less surreal. RTE: From your own point of view . . . if there’s less money circulating in the economy your members are going to have less money coming in the door to their businesses. FIELDING: Yes. And at that moment that is happening as well. But it’s happening because of economic uncertainty and because of a lack of consumer confidence. People are afraid to spend at the moment because we don’t know where we are going at the moment. They’re look at the Government dithering at the moment and wondering – are we going to see a Bord Snip or not, are we going to water it down. This is strange even by ISME’s standards. In essence, Fielding is saying there is less spending in the economy because people are concerned that the Government might not have the will to cut people’s disposable income which would result in . . . less spending. Hmmm. Now, if I were an owner or manager of an enterprise, I would be seriously concerned. Here’s why. Even with the recession slowing down – tax increases and public spending cuts will hamper consumer spending. The ESRI provides some indication of the likely impact on consumption. We see that, in both expenditure cuts, consumption falls considerably. Combined, they total nearly a 2% cut. To put some numbers on this, based on ESRI projections for next year, we could eventually see a fall of €1.5 billion by the second year. That’s a lot money taken out of consumer circulation – and this will be felt in firms’ turnovers. This is not a good time for this to occur. Though some forecasters are now a bit more upbeat about consumer spending (Davy forecasts consumer spending to increase by 1.5 percent next year), the Retail Sales Indexhas yet to stabilise according to the latest data. The last month we have data for, July, shows a month-on-month decline. That this occurred after a volume increase in June (the first monthly increase Since September of last year), shows that consumer spending remains fragile. This is confirmed by Exchequer returns which saw VAT revenue coming in well under target. In September, VAT receipts fell 13% below the monthly target. We have some ways to go before consumer spending stabilises. Yet, rather than address the fall in consumption, ISME ups the deflationary stakes by calling for social welfare cuts, including Child Benefit cuts. If the McCarthy Report recommendation is implemented – the cut in €850 million in social welfare cuts will make another dent in consumption, especially as this will hit people who have a higher propensity to spend. The CSO is still recording a fall in prices. This will force businesses to (a) drive down prices, or (b) drive down their costs – of which wages will be one. In the former, revenue will fall further if it is not being recouped through an increase in volume. Of course, it can get to such a stage that a business can’t cut prices anymore and goes out of business. In the latter, while it may seem ‘penny-wise’ at the firm level to cut wages (reducing costs), it would be ‘pound-foolish’ at the national level because it would lead to a further reduction in consumption – spiralling ever downwards. And in both cases, public finances worsen as deflating prices and falling wages undermines tax revenue. If I were an owner or manager of an enterprise I would know this instinctively. I would want the Government to reflate the economy – to do everything possible to maintain and enhance incomes, maintain and expand employment. Because that will increase my turnover and end the need to cut margins to attract volume, traffic, football. The deflationary pressures would stop and the economy could start spiralling upwards. That’s when you pursue fiscal consolidation strategies – after the economy is on growth path. That’s when it will get produce positive rather than negative returns. If I were an owner or manager of an enterprise, I would cancel my membership to ISME. David Begg’s suggestion that the target date for returning the Irish budget to Maastricht compliance (that is, bring the annual deficit to below -3% of GDP) be postponed for four or five years certainly did get a response. Even Chairman Colm McCarthy felt moved to pen his thoughts on the suggestion (he wasn’t terribly enthused). And the Government moved quickly to stomp on the idea as well. Other commentators waded in over the weekend as well - running as far away as possible from the notion. No sooner had David left the Morning Ireland studios last Thursday – where he made the suggestion – than Brian Lenihan was dismissing any notion of postponing the 2013 target date. He cited a number of reasons: higher interest payments, agreement with the EU Commission, the 2013 target was already a ‘long time’, etc. In October last year, the Government projected an annual deficit of 6.5 percent, with the budget returning to Maastricht compliance by 2011. That was a long time ago in a galaxy far away. By January, the Government rewrote their budgetary projections in an Addendum. They projected a deficit of 9.5 percent with public finances returning to Maastricht compliance by 2013. Prior to April, they were concerned that the deficit was spiraling downwards to 12.75 percent. Therefore, they introduced the April budget to hold the deficit at 10.75 percent. What’s the projection now? The Government will probably announce that the year-end deficit will be -12 percent. This is certainly the consensus of independent forecasters. Do you see a pattern? The Government, so fearful of seeing the deficit plummet to -12+ percent introduced a number of deflationary measures which pretty much ensured the deficit will plummet to -12 percent and possibly lower. During a recession, fiscal strategy must be focused on ending the recession as soon as possible. ONLY once the economy has come out of recession and back on a sustainable path can fiscal consolidation strategies be effective. Pursuing fiscal consolidation during a recession is like running in quicksand. During the past year the Government increased taxation by €1.8 billion and cut spending by €3.2 billion (capital expenditure, April measures, pension levy) – an ‘adjustment’ of €5 billion; and still the deficit rose. We are now in a dark place – a much weakened economy saddled with a high deficit. And the Government is preparing for another assault on the economy - €4 billion mostly in public expenditure cuts. As we have seen, public spending cuts will weaken the economy further with little benefit to the deficit. But do these machismo commentators glimpse this fact? Not a bit. They see neither the woods nor the trees nor the broken bodies from all that timber falling. I suspect the reaction to David’s comments is not so much about his proposal to extend the target date. After, all the Government has done that already this year. Rather, he has touched a raw nerve - that there is little chance the Government can reach its target because their fiscal strategy, to date, has been wrong. In the April budget forecast, the Government not only projected a deficit this year of 10.75 percent, this is their projection for next year as well. In other words, they only left themselves three years to close the gap– a gap of 7.75 percent. That was always going to be big ask – cutting the deficit by over 2 ½ percent each year. Now their starting point is much worse: -12 percent. And the fiscal deficit is going in the wrong direction. Of course, the recessionary fires are abating somewhat. With emigration climbing, unemployment costs are rising less rapidly (this is what saved the Fianna Fail bacon back in the late 1980s). But now we have we have a weaker economy – more unemployed, less spending, less investment. If, as per the April projections, the Government can hold next year’s deficit at this year’s level, it will be looking to close a 9 percent gap in three years. We desperately need a debate, not in some kind of ‘wouldn’t-it-be-nice’ world, but whether it is realistic or even desirable. If David’s intervention introduces a dose of reality in the debate, it will have been a good day’s work. For at the end of the day, it is process – not targets – that counts. If you get the process wrong, you can set yourself all the targets you want. They will be just so many falling trees. Imagine you’re walking a high-wire. You’re nearly at the end of line. You’re doing everything possible not to fall – balancing with your arms, moving snail-like, praying; the last thing you need is for some messer to start shaking the wire. That’s exactly what the Government is preparing to do as it mulls over its €4 billion worth of cuts in the upcoming budget - shaking the wire. With ICTU’s launch of a campaignto stop the cuts, commentators will be queuing up to have a go at trade unionists – particularly public sector workers. You can write the script now – ‘privileged’, ‘sheltered’, ‘bloated’, ‘over-paid’, etc. That workers are engaging in action to protect the quality of public services and the living standards of the poorest is no matter; they are ‘not in touch with reality’ as Colm McCarthy might say (actually, he did). Yes, there is the issue of protecting public services – which rank well below the EU-15 norm; and there’s the issue of protecting living standards – another vital issue given that the McCarthy Report wants to cut nearly €2 billion in transfers to low and average income earners. And, yes, many public sector workers will protest over wage cuts– but after social welfare cuts, levy increases, and the pension levy, this is reasonable. But there’s another reason why trade unionists should be marching – to prevent the Government from shaking the economic wire and causing more people to fall off. It appaears that the recession will end (at least in a statistical sense on a quarterly basis) anytime between the 1st and 3rd quarter of next year. If these cuts are implemented, the end of the recession will be postponed, national output will fall further than it would have otherwise, more people will be on dole, more enterprises will go the wall – with only a minimal benefit in the fiscal deficit. If the trade unions really engage the fight, they will be doing so, not on behalf of a sectional interest, but on behalf of the nation’s economic interest. Let’s turn to the ESRI’s multiplier simulations. They modeled three public expenditure measures – cutting public sector wages, cutting 17,000 public sector jobs and cutting public investment. Each of these would reduce current expenditure by €1 billion each, or €3 billion combined. What would be the effect? Unemployment would rise by nearly 29,000 – just as the recent Live Register figures showed almost no growth in seasonal terms. All this, to reduce borrowing by less than 1 percent of GDP? If that sounds irrational it’s because it is. And that’s why hardly any other government in the industrialised world is pursing this absurd course. The annual deficit would fall further if a tax strategy were used. The end of the recession would not be postponed and everyone would be better off. That is not to endorse the particular tax proposals used by the ESRI. They merely serve as an indicator. Of course, we could get really creative – less deflationary tax increases on high incomes and wealth, public enterprise infrastructural investment (off the books), necessary social investment with high economic returns (early childhood education), front-loading the drawdown of the €20 billion in the NTMA’s coffers; a whole range of measures to stimulate the economy while at the same time setting the foundations for a fiscal consolidation that can only be effective once the economy has returned to growth. But, really, the idea that this government, which has pursued deflationary policies from day one, is somehow going to change direction at this stage is pure fantasy. Inertia, not rational economic thinking, is propelling Fianna Fail. We can’t expect them to make things better, but we can try and prevent them from making things worse. That’s where the trade union campaign enters. It is imperative that it succeeds – that it derails the Government from its determination to push through €4 billion in cuts. It is both an economic and social imperative. And if, in the meantime, the action derails the Government itself – who will complain? If the trade union movement, in alliance with community and social organisations, and progressive political parties can prevent the Government from prolonging the recession and increasing unemployment– then they will have done the economy enormous benefit. If the trade union movement and their allies fight – and I mean really fight – then they will be right. And all of us will reap the benefit.